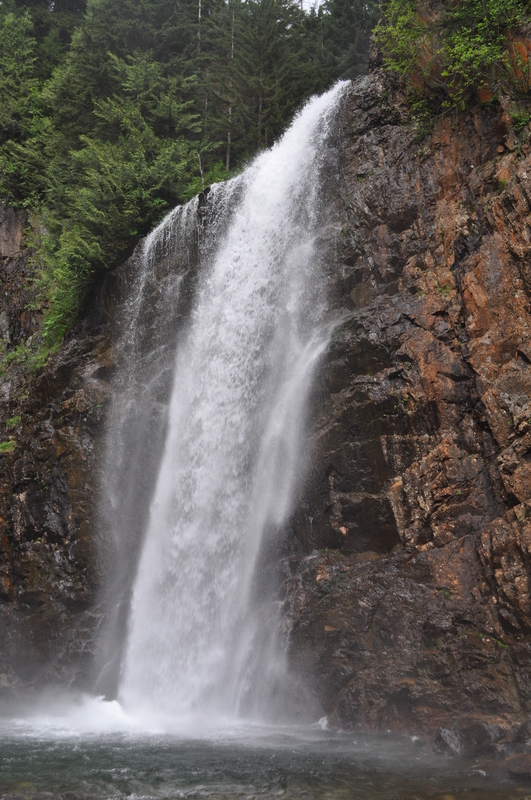 25 May 2015 – Using a great book, Central Cascade Day Hikes, Sherrie found a nearby hike 45 minutes away to Franklin Falls in the Mt. 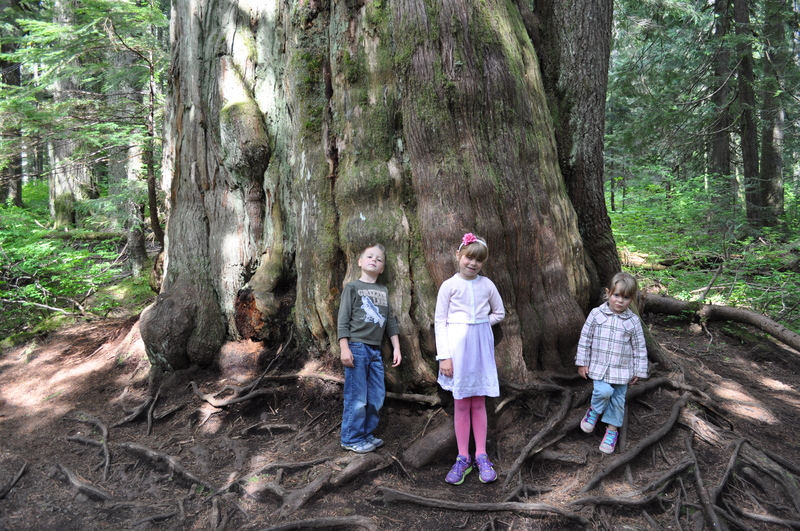 Baker-Snoqualmie National Forest. 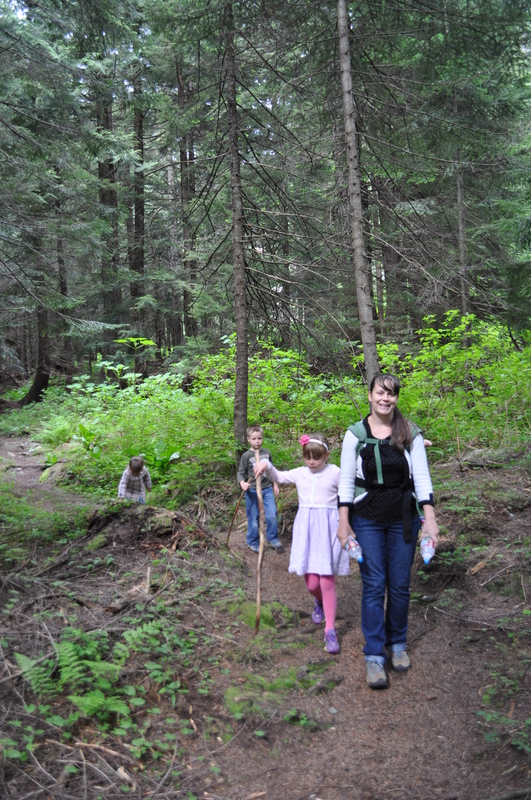 The hike is 2 miles in and back along the ravine of the South Fork of the Snoqualmie River. 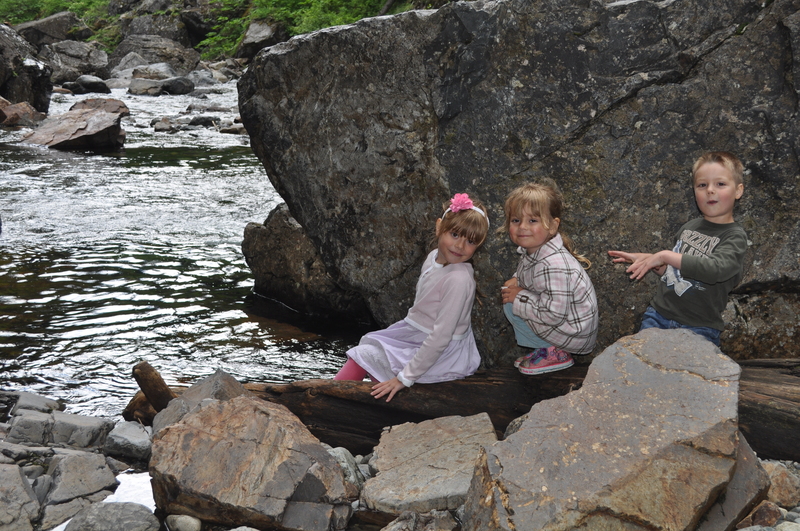 The views of the river and ravine along the way into the falls is quite nice with several look out opportunities. 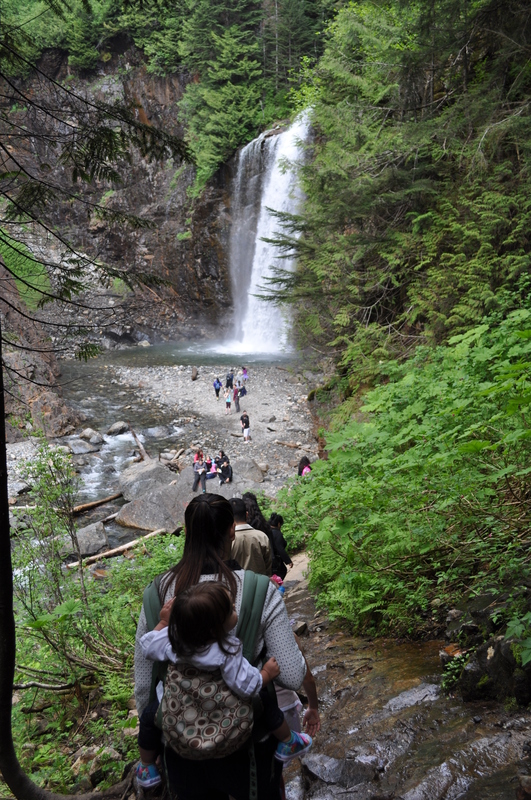 However, because of the accessibility of the hike it is quite crowded on a nice spring day. 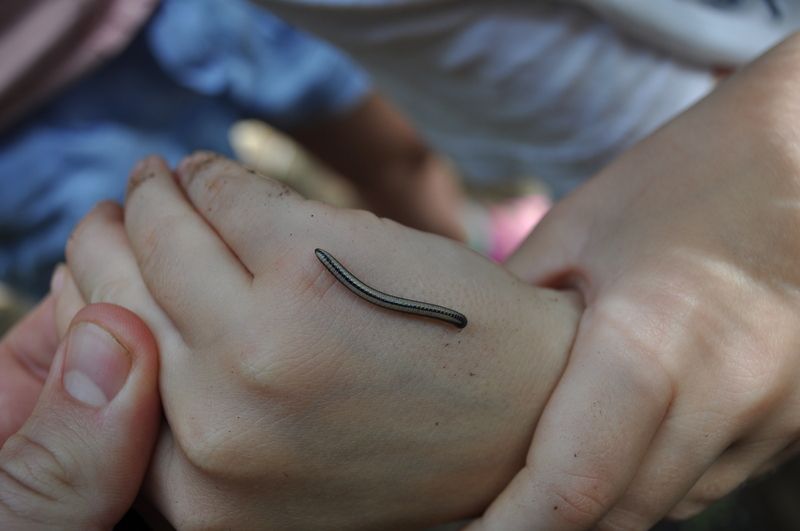 This makes the trail a bit less enjoyable. A small scramble down some rocks – which were not as slippery as I expected – brings you to the base of the 70 foot falls (further upriver the river falls another 65 feet in two separate but those are not visible from the trail). The falls produce a small splash pool and quite a lot of mist and water vapor. Turning around on the trail we decided to take an off-shoot which lucky for us was the other trail we read about – the Wagon Road Trail. 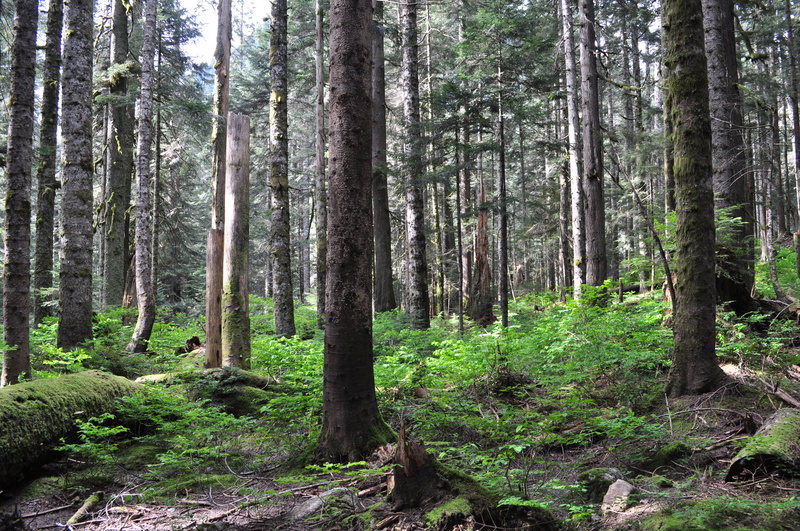 The trail travels along a remnant of the Snoqualmie Wagon Road. 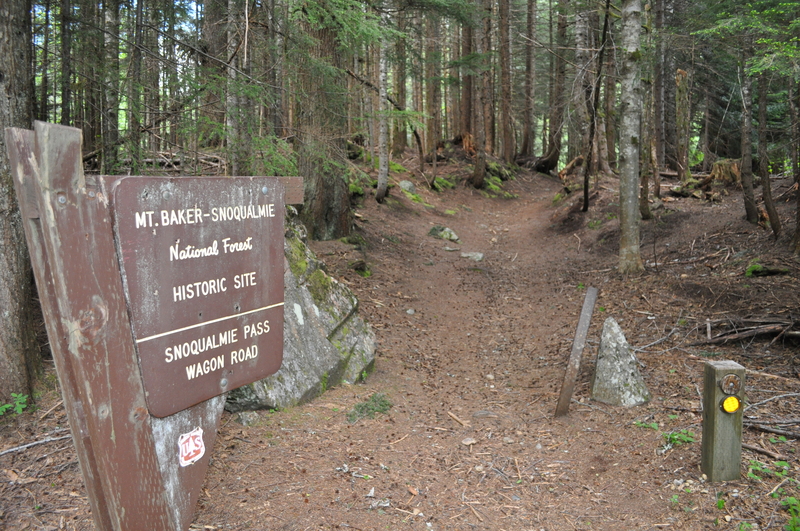 This road was the first wagon-capable road across Snoqualmie Pass completed in 1867 (see history). We didn’t pass anyone on this trail (and I’m surprised others didn’t use this second, and more enjoyable route) and the quiet in the forest along with the variety of flora and presence of animal tracks was wonderful. 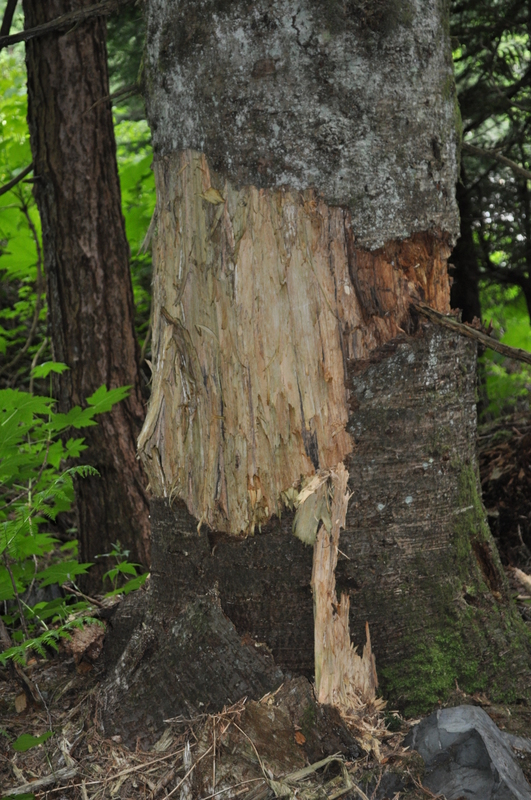 We even spotted bear-sign. 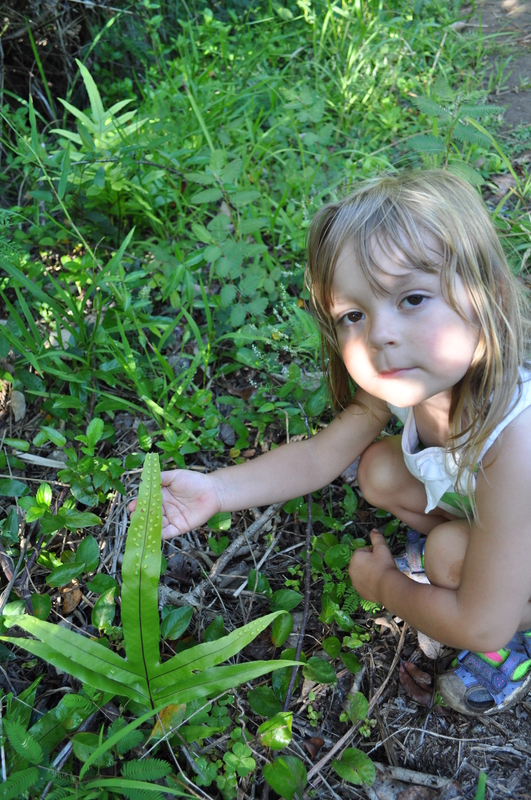 The smell of skunk weed was very apparent – but luckily not overwhelming. 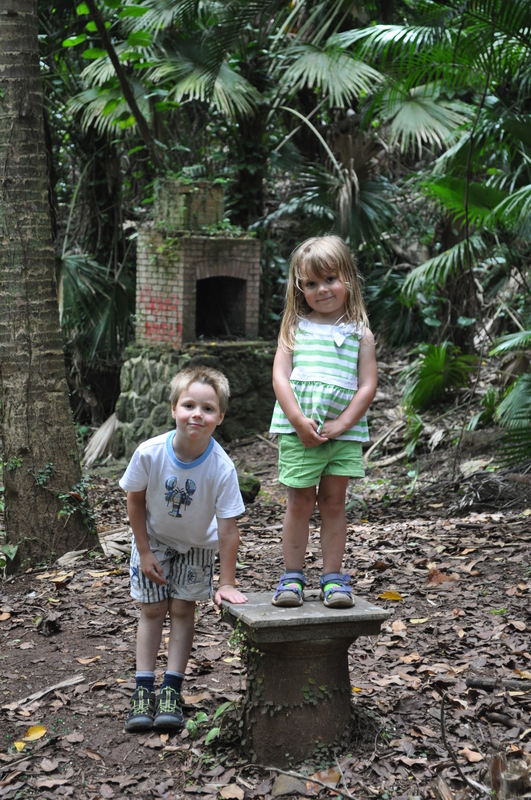 The kids had a great time and it took us approximately 2 hours with plenty of time to explore and enjoy. It certainly makes us appreciate the Pacific Northwest and the astounding beauty in which we are surrounded. 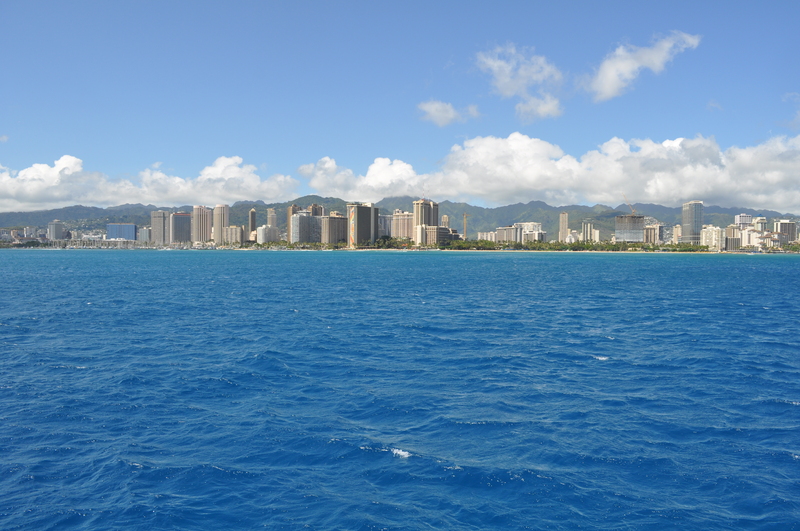 19 May 2015 – We decided to spend most of our time on our last day in Hawaii swimming. 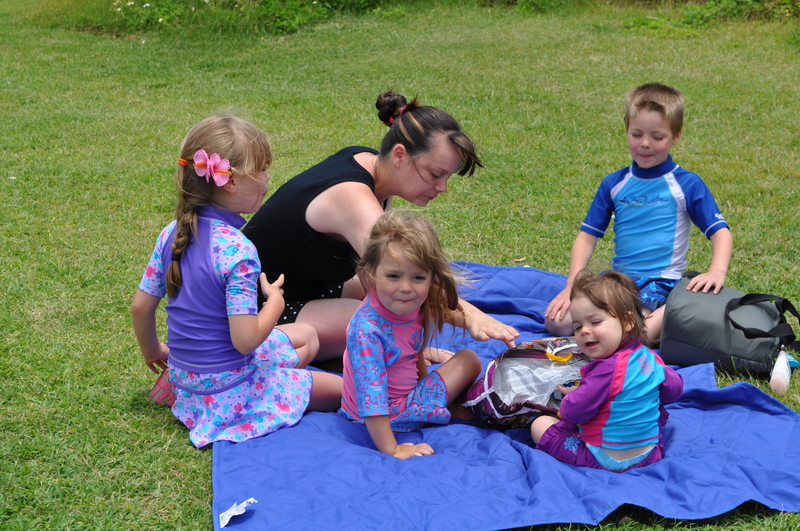 I took the kids to the pool in the morning for an early swim and then we headed up to the North Shore for some lunch and beach time. 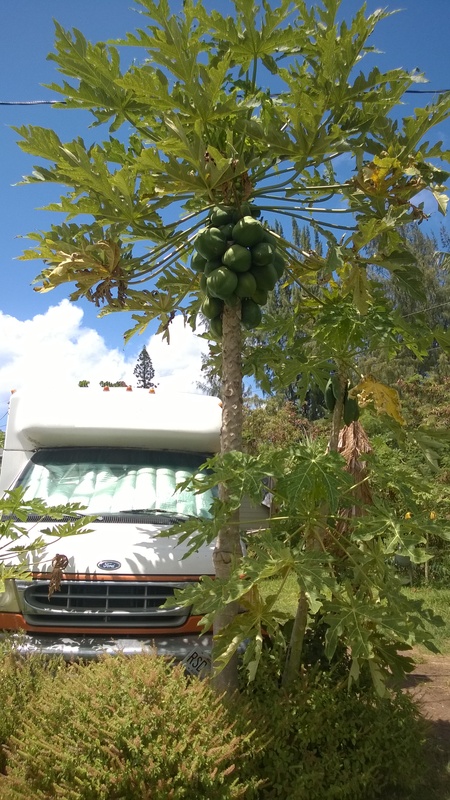 We had lunch at a Thai food truck near Giovanni’s shrimp truck surrounded by papaya trees. 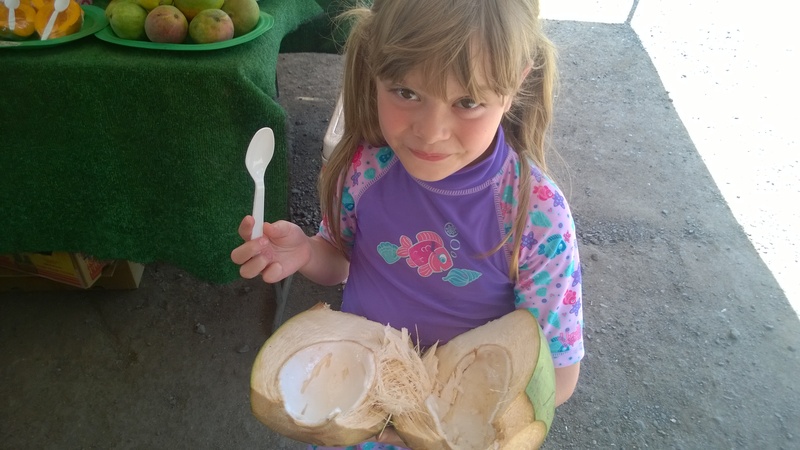 Heading back south towards the better beaches we stopped for a quick treat – fresh coconut and sugar cane. 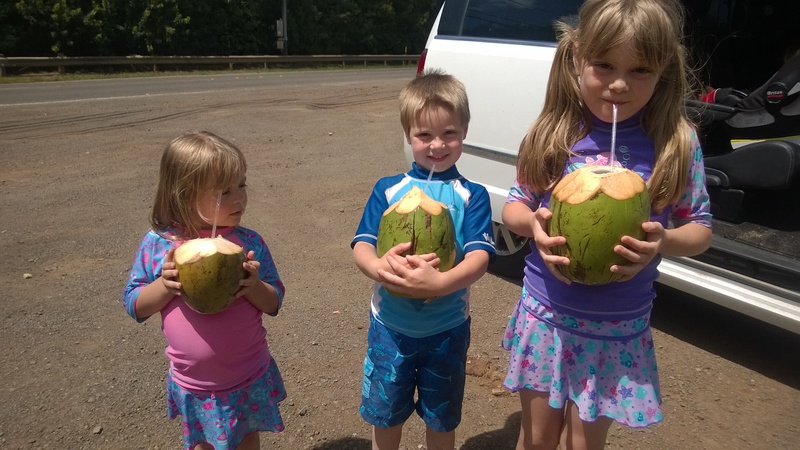 First the kids were given the coconuts to drink and then we had them split to eat the meat. Isabella loved it but Aurelia and Lucas didn’t care for it too much. 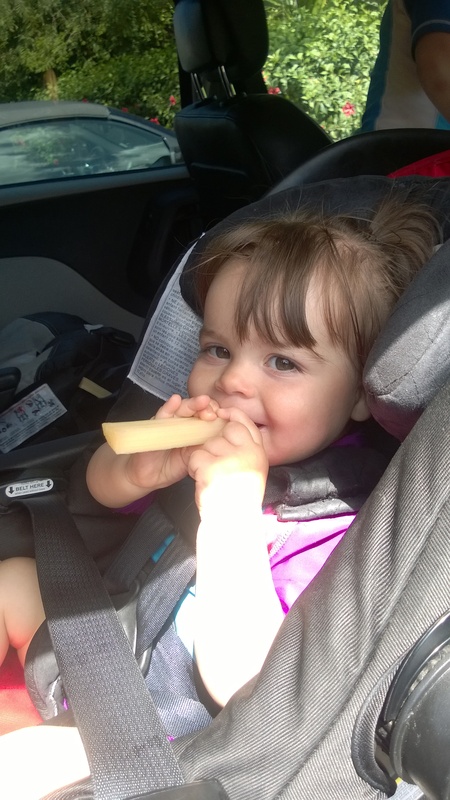 Giuliana enjoyed chewing on her sugar cane. After our snack headed back to Sunset beach so the kids could play in the waves. The waves were perfect for the kids, except Aurelia who was sucked into the break a couple of times while trying to fetch water for her bucket. 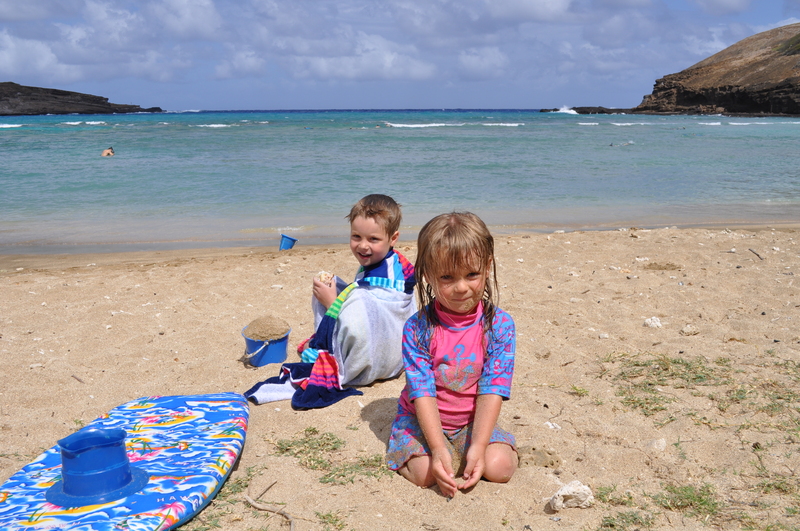 After playing in the waves the kids tried to excavate the sand from the beach for a couple of hours. It was a great time and a really nice time on the beach. After time at the beach we headed back to the house to enjoy an hour in the pool (helpful in cleaning off the beach). 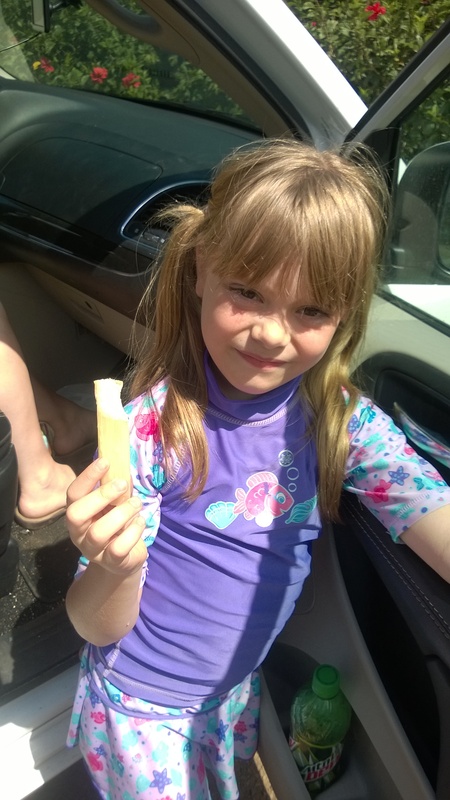 We also used the grills near the pool to enjoy hot dogs and sausages after swimming. 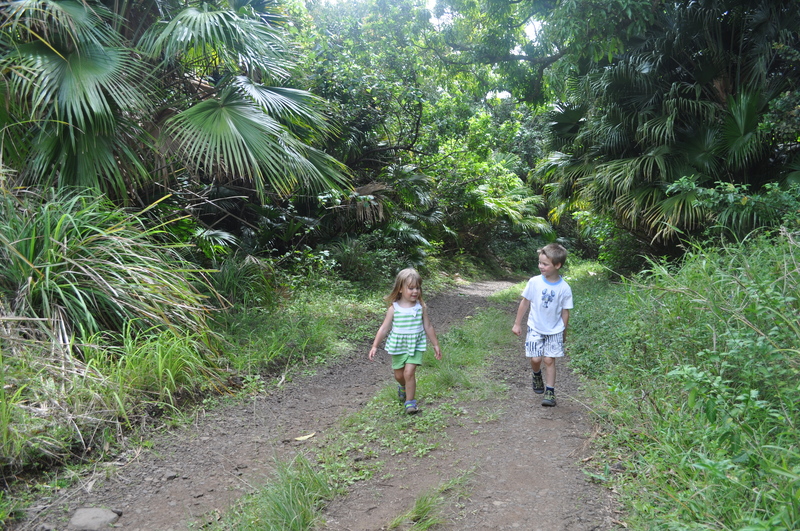 We will miss our time in Hawaii but really enjoyed the time we had with many memories of our adventures and time together. 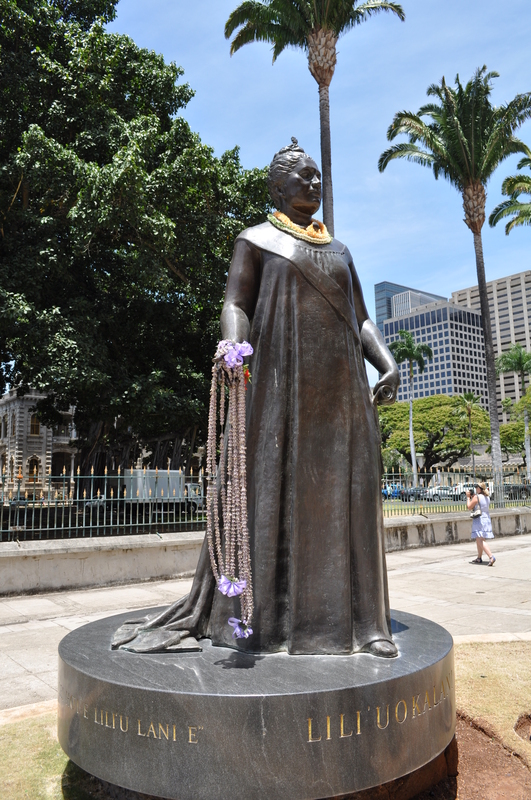 18 May 2015 – We headed into downtown Honolulu for some sights. 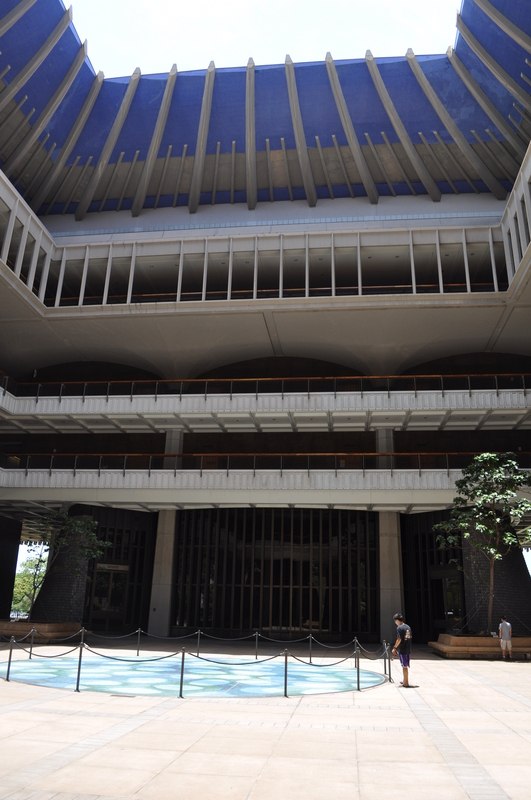 We planned on going to the IolaniPalace, Duke’s Canoe Club for lunch, and the Bishop Museum. Things didn’t go as plan but we enjoyed the day nonetheless. 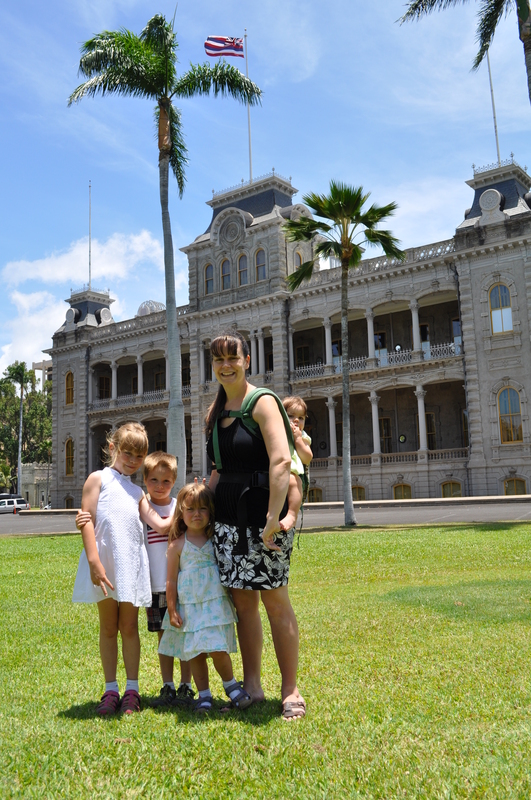 When we arrived at the Iolani Palace we didn’t anticipate the timed entry aspect and unfortunately the next available entry time conflicted with our lunch reservations. 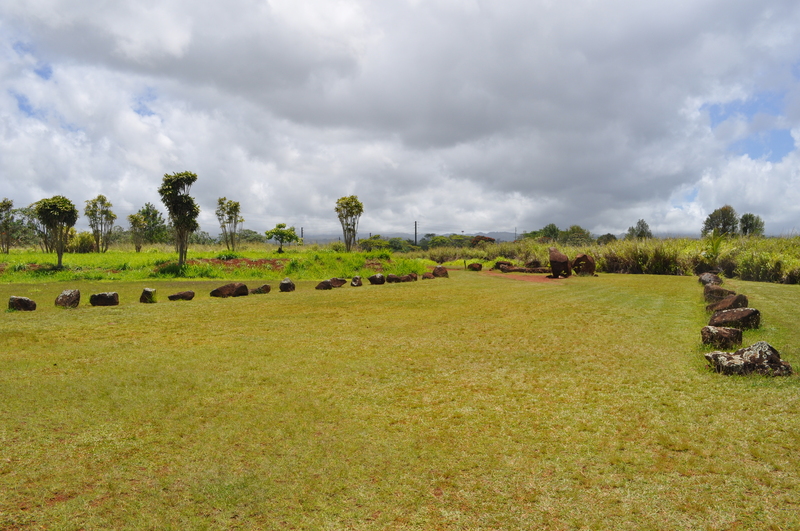 So, we enjoyed the park and exterior of the palace and walked around instead to visit some of the nearby Hawaii State sites. 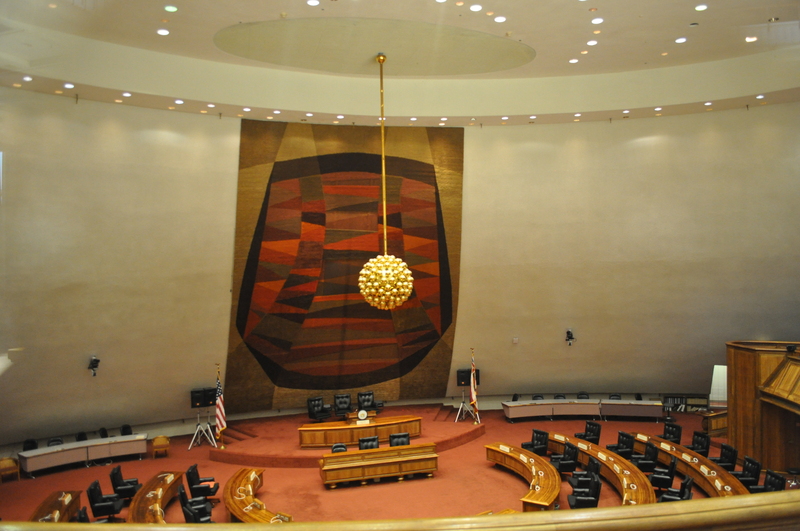 In the same complex as the Iolani Palace is the Hawaii State Senate and House of Representatives. We walked through the State House building which is so very unique as a round building with a large central atrium. 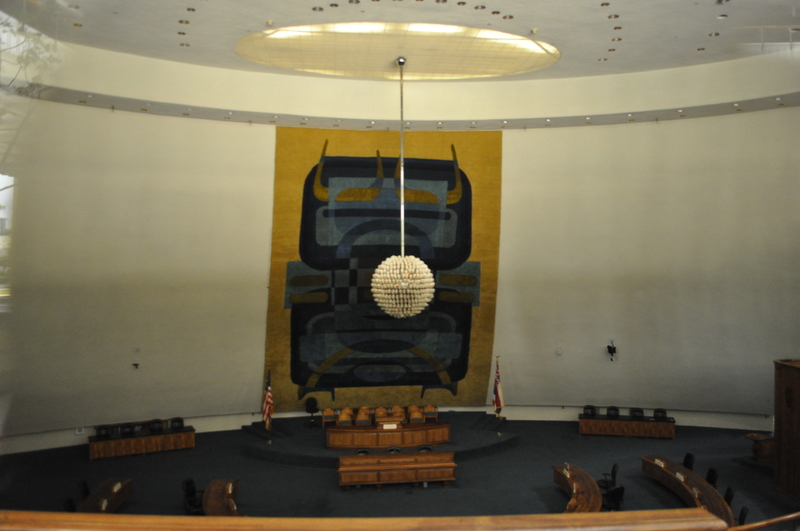 The House and Senate chambers are also easily visible from the atrium through very large windows. It was a great opportunity to teach the kids about bi-cameral representative government. 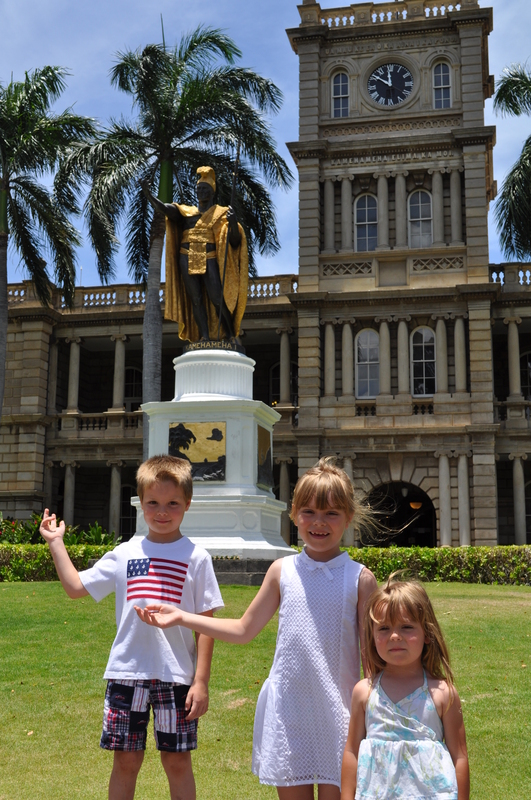 After the State House we walked around the Palace again to the other side of the complex and across the street to the Aliʻiōlani Hale – which historically was built as the central government building for both the Kingdom and Republic of Hawaii in the late 1800s. 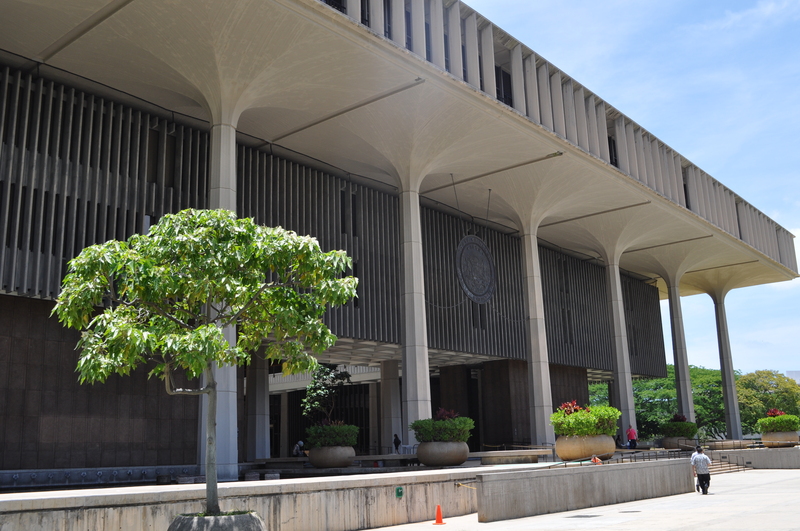 Just outside the entrance is a famous statue of Kamehameha and reliefs depicting famous early Hawaiian historical events. 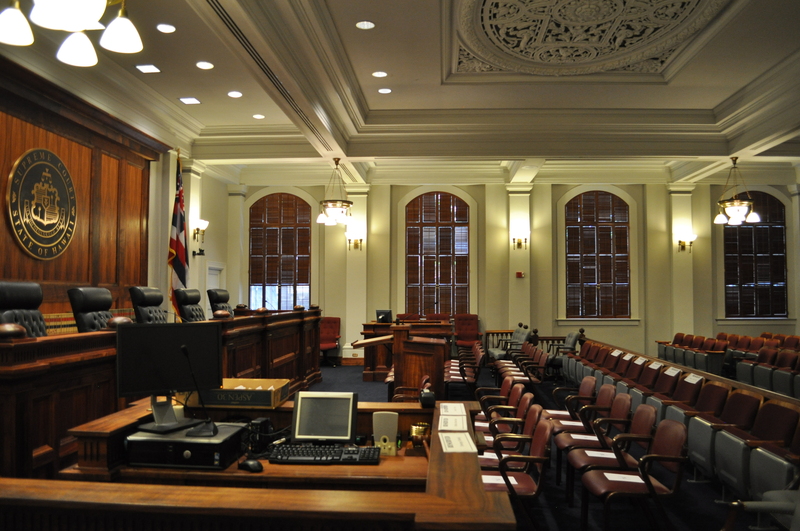 Inside the Aliʻiōlani Hale, and since 1911, sits the Hawaiian Supreme Court. 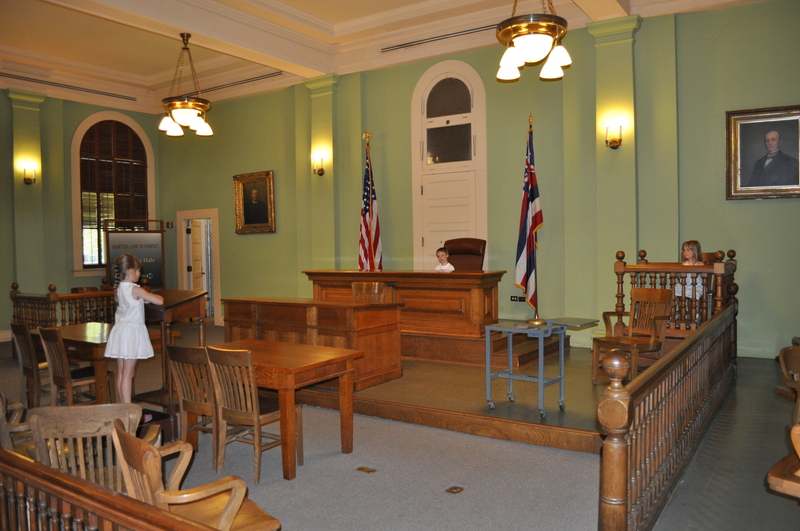 The building contains both the current court room as well as the original 1916 court room now part of a museum on the history of the Hawaiian judiciary. 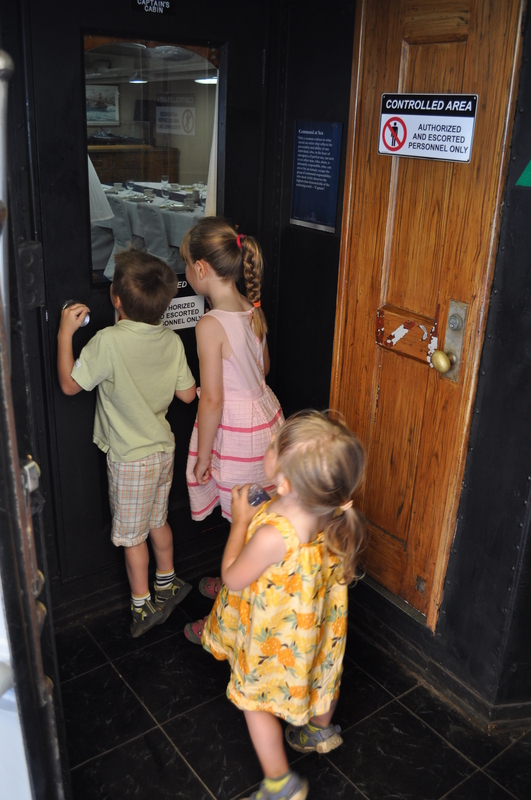 The kids loved the old court room and they spent time playing court. Both the State House and Supreme Court were fascinating and unique and the kids enjoyed both. 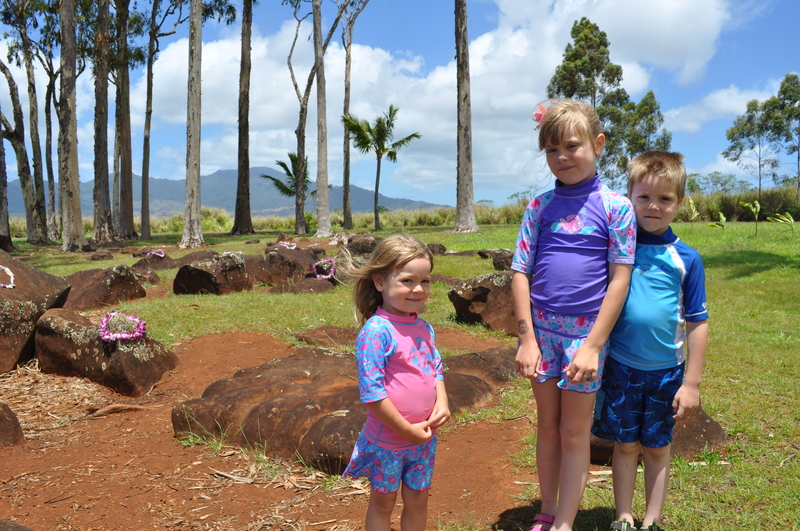 We left the Aliʻiōlani Hale for Duke’s and our lunch reservation. Duke’s sits on Waikiki inside the Outrigger hotel. 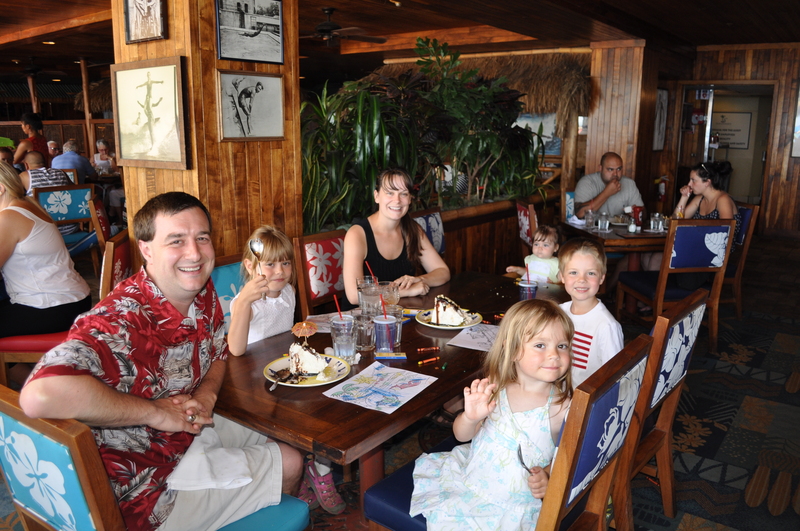 It is a very good restaurant with prices comparable of others along the beach. 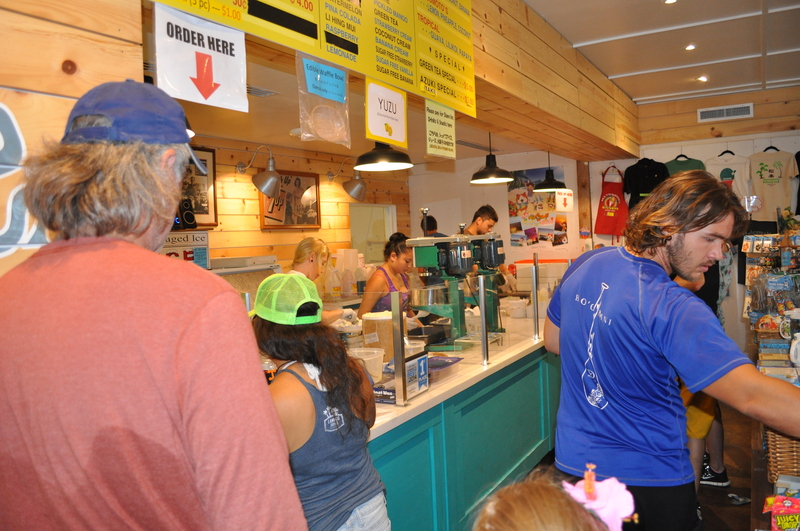 Their Cajon fish tacos were excellent and the kids enjoyed the fish and chips. 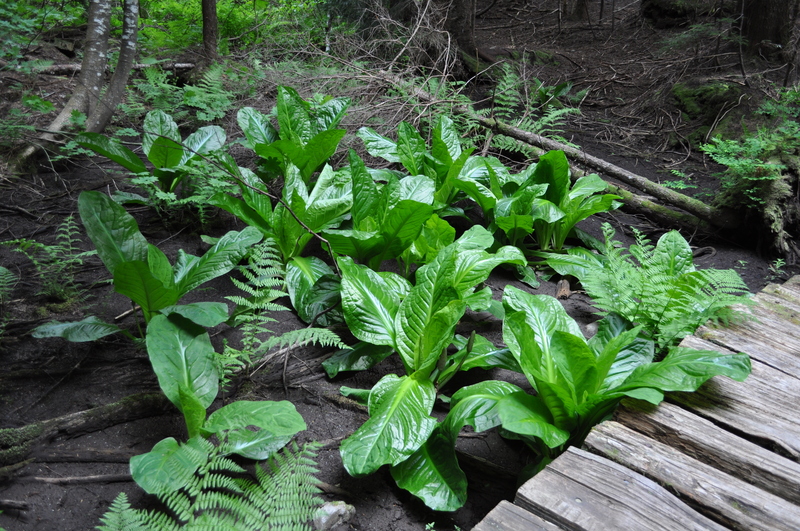 Sherrie had the salad bar with Guiliana. 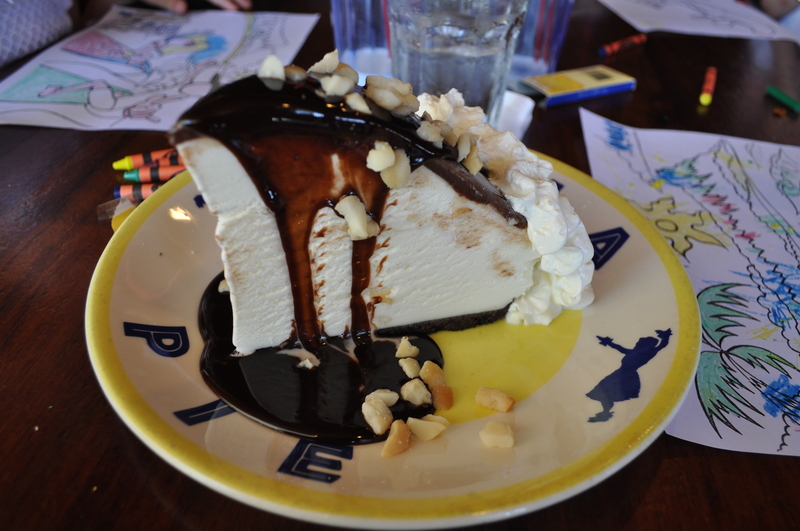 Of course, we finished lunch with two Hula Pies – which as always were excellent. 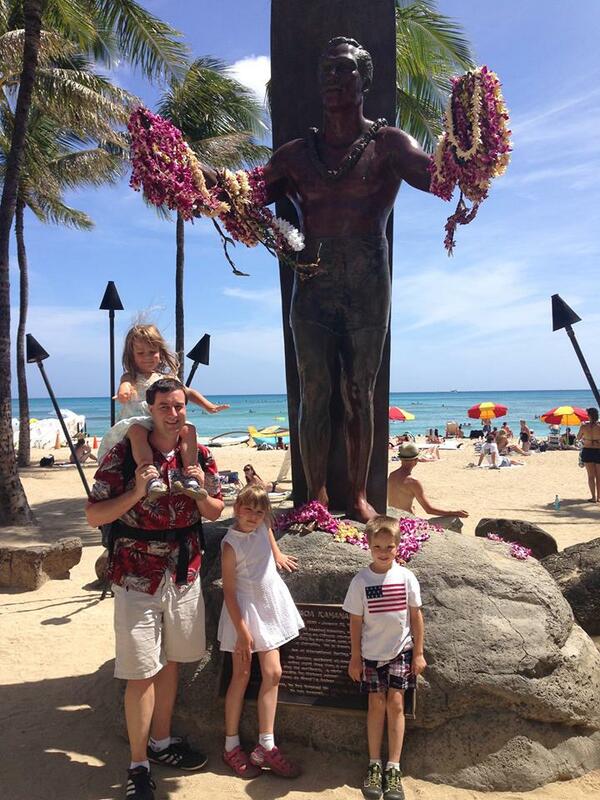 We walked back to our car along Waikiki and couldn’t help but stop at the statue of Duke Kahanamoku for photos. After Waikiki we drove over to the Bishop Museum but found we had misplaced our tickets – which we subsequently found the next day while packing to head home. Instead we decided to go back to the pool and spent several hours swimming to finish our day which is never a bad choice in Hawaii. 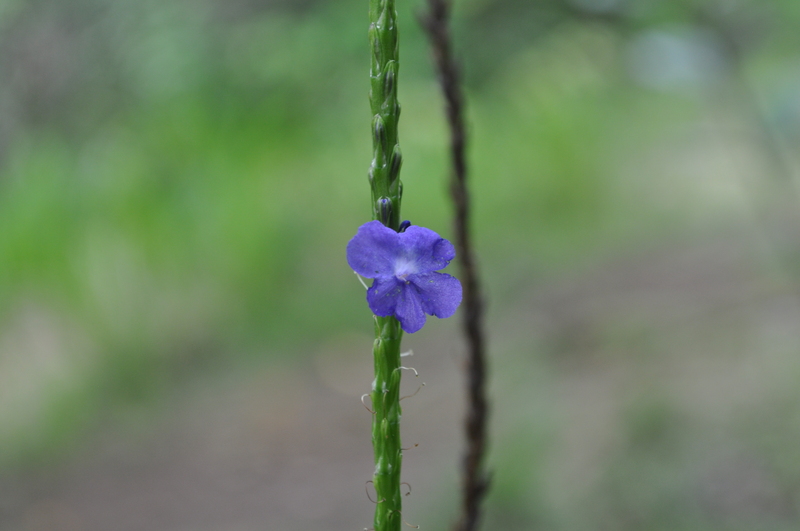 17 May 2015 – We enjoy hiking so much in Hawaii. 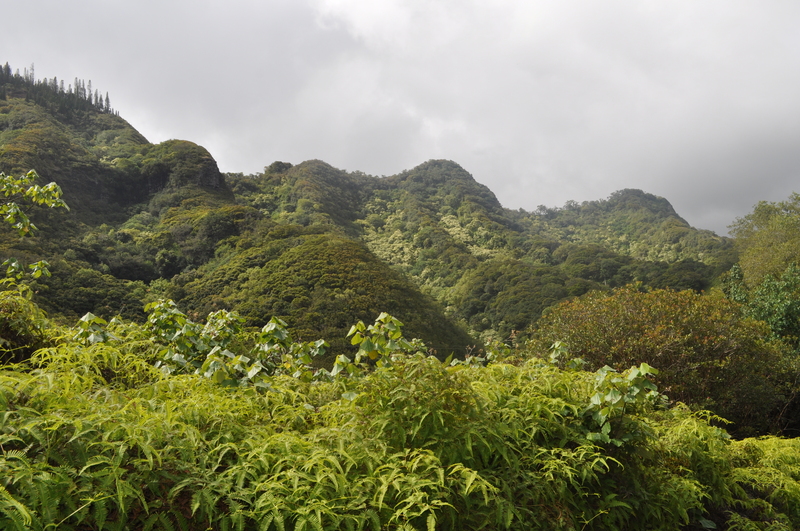 Sherrie chose a hike just outside Honolulu up the Kamananui Valley. The weather started warmer as we began our ascent into the valley but cooled off with a nice breeze and some passing showers. The trail is an unimproved dirt road with remnants of the rocks and cobbles which defined the road during its almost 200 year usage. 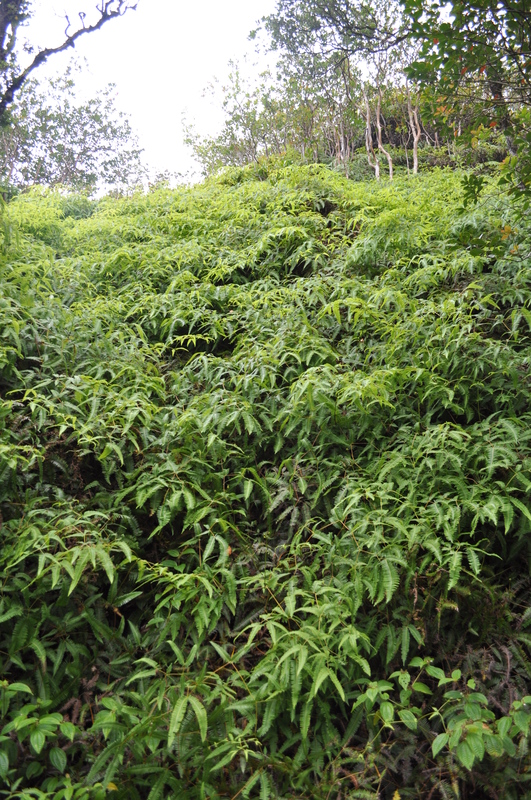 The road was previously the access method into the various plantation sites within the valley. 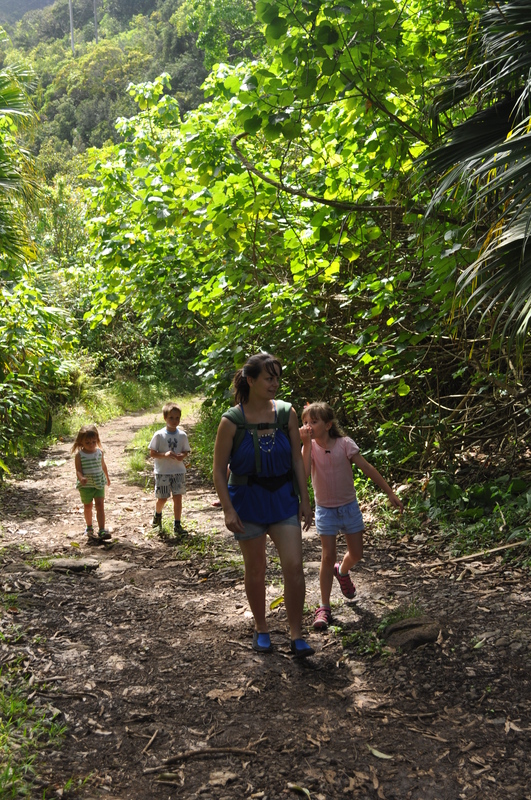 The trail is wide and flat as you would expect and gains about 500 feet during its 3.5 mile length. 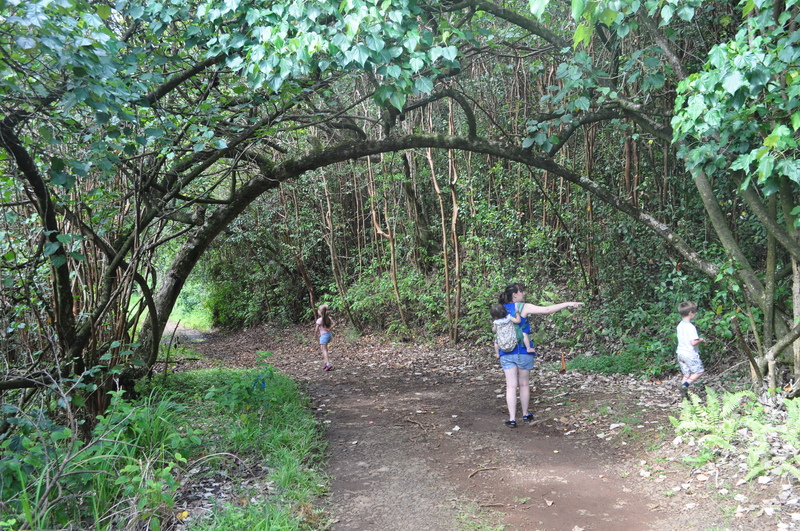 Only one plantation site is easily accessible off the trail. It has a double stairway up to the main living area and a further set of stairs which lead to exterior areas of the residence. 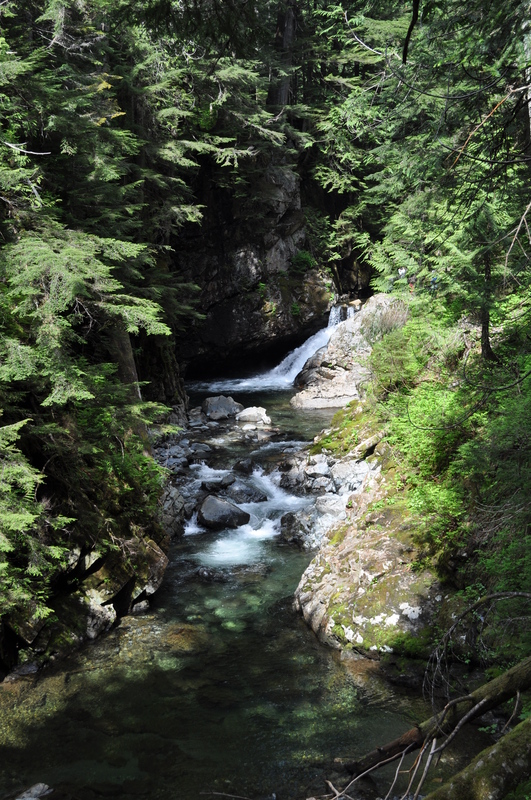 The trail is also known for its bridges which cross the many streams flowing down the valley – without these bridges the road would be completely inaccessible most of the year. 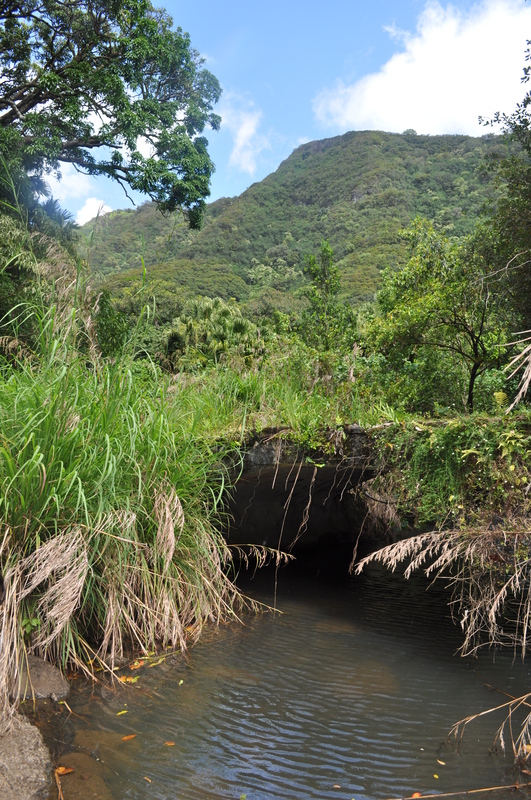 There are other signs which illustrate the long usage of the Kamananui Valley by humans. 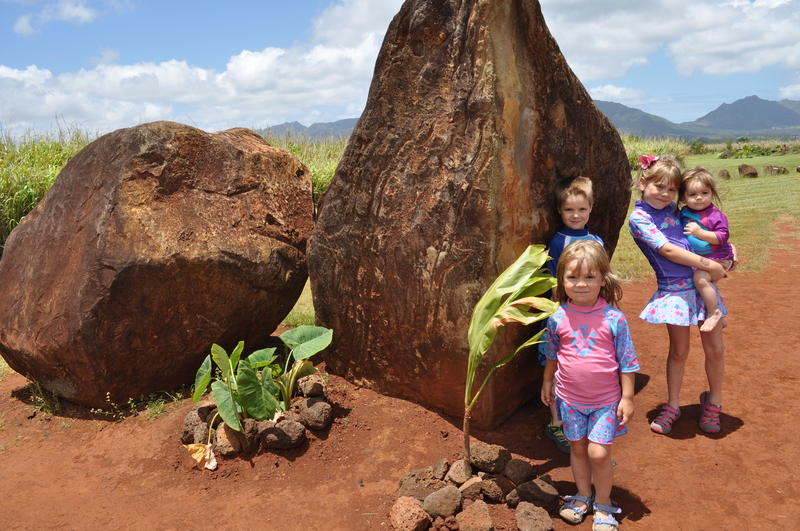 This includes some of the best preserved petroglyphs in Hawaii. 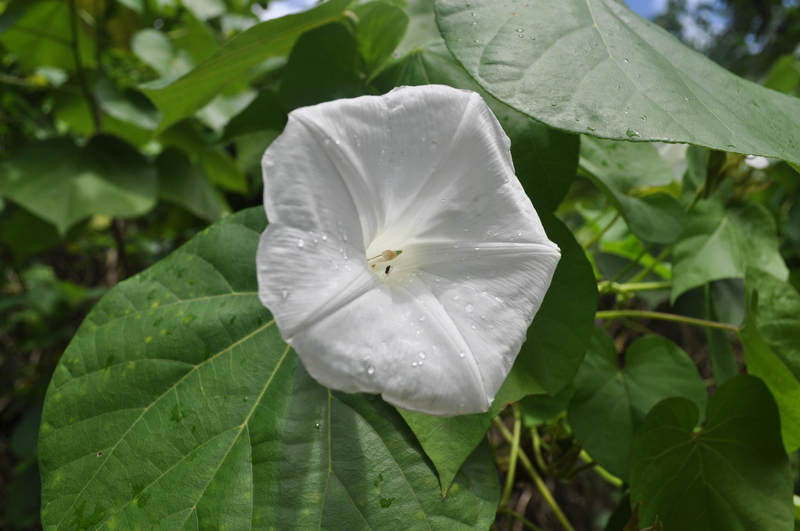 One of the most enjoyable aspects of hiking in Hawaii is the flora and fauna which abound and thrive in this climate. 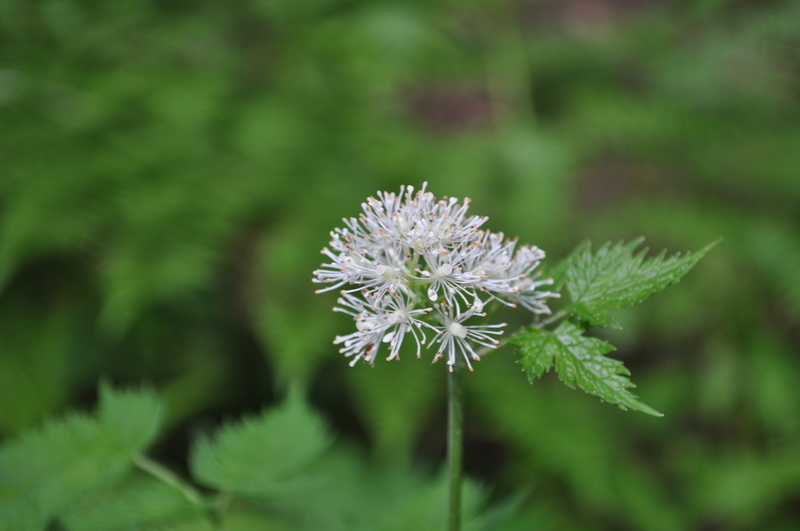 Especially as it is so different from the temperate forests we are used to. 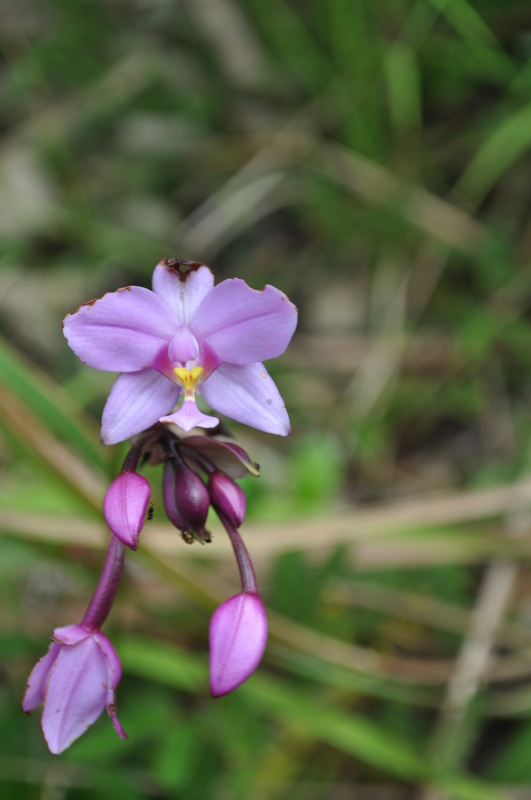 While there were not too many flowers along the trail those that were present were amazing. 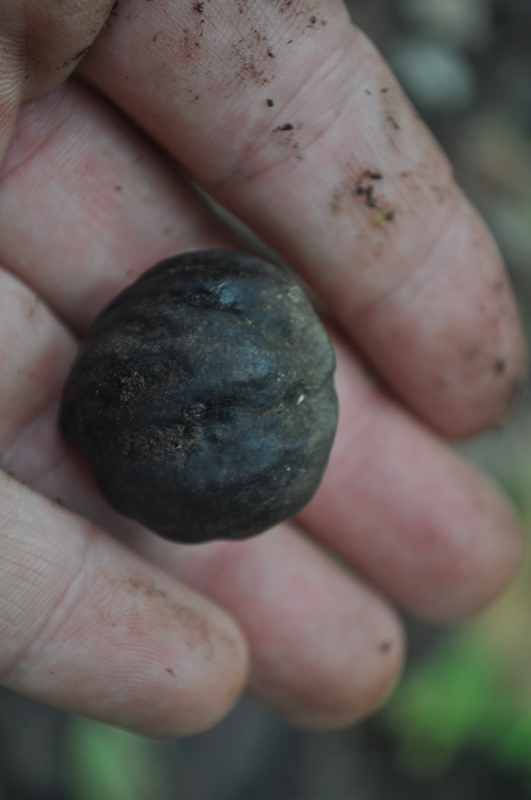 The trail covers 9 distinct forest zones – starting the the Guava Zone. 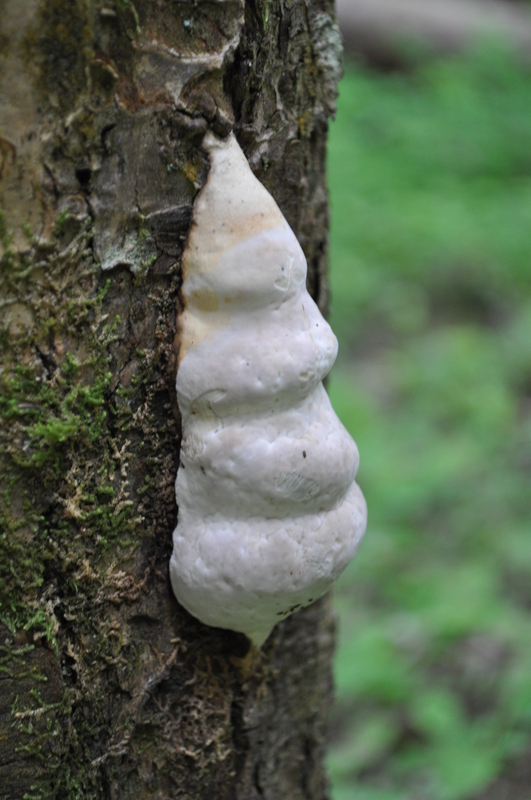 As such the trees change significantly as you travel. 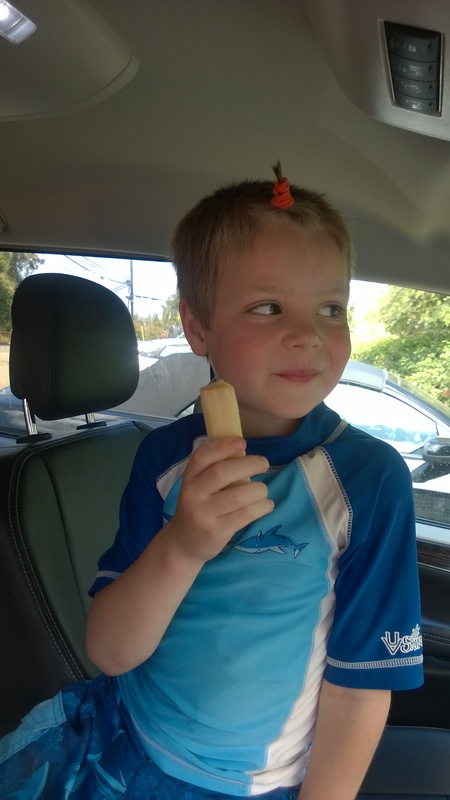 16 May 2015 – After visiting the Kukaniloko Birth Stones it was lunchtime and we continued towards the North Shore for the time-honored tradition of obtaining and consuming Hawaiian shave ice at Matsumoto’s. I got the “Hawaiian” (Coconut-Banana-Pineapple), Isabella chose Coconut-Strawberry-Banana, Lucas chose “Rainbow” (who knows what is in that), Aurelia chose Bubble Gum-Cotton Candy, Sherrie chose Li Hing-Raspberry-Lemon. Of course we also add ice cream on the bottom and condensed milk on top giving it a rich creaminess. We sat outside and enjoyed the beautiful sunny weather while eating our lunch of shave ice 🙂 Aurelia ate some and then mixed it all up into a slurry claiming she was making “pie.” I gave Giuliana bites of mine. 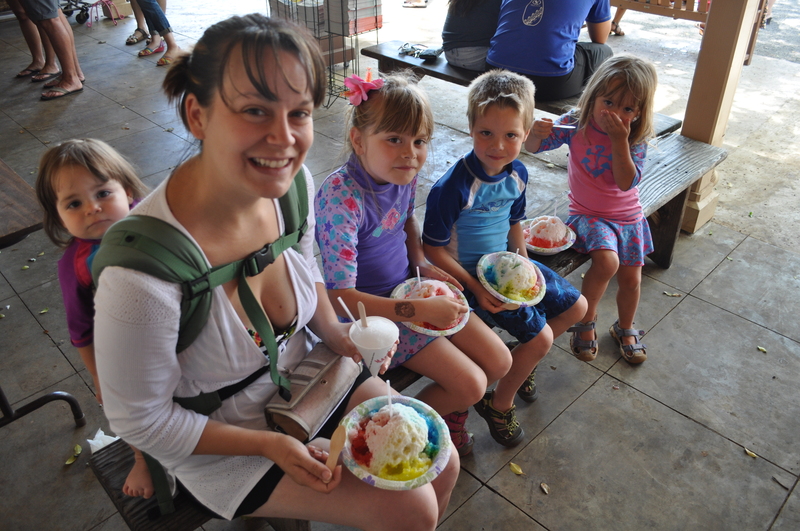 After shave ice for lunch we continued down the North Shore towards Sharks Cove for an afternoon of snorkeling. 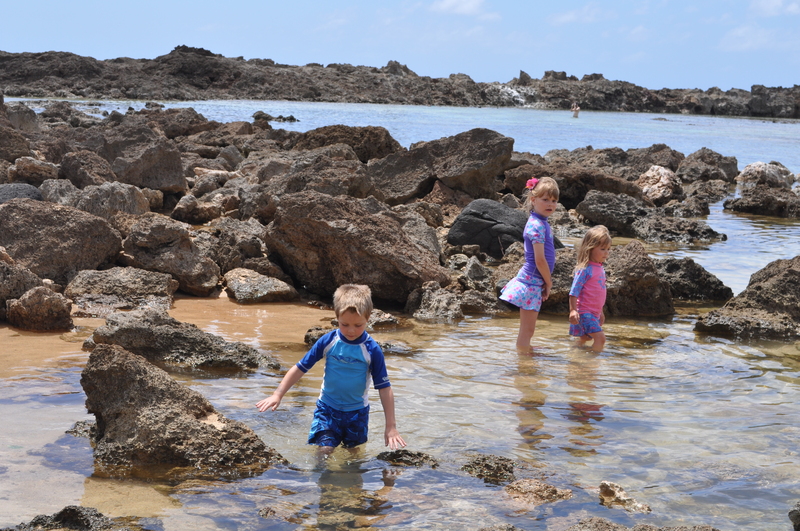 Sharks Cove is a nice place for the family because it offers something for everyone. The cove itself is protected from waves making it perfect for Giuliana to play in the water, the calm water and rock/coral creates the perfect snorkeling conditions which even Isabella and Lucas can enjoy, and the water is just deep enough with many fish and crabs in the shallows for Aurelia to enjoy. Finally, of course there is adult-level snorkeling for Sherrie and myself. 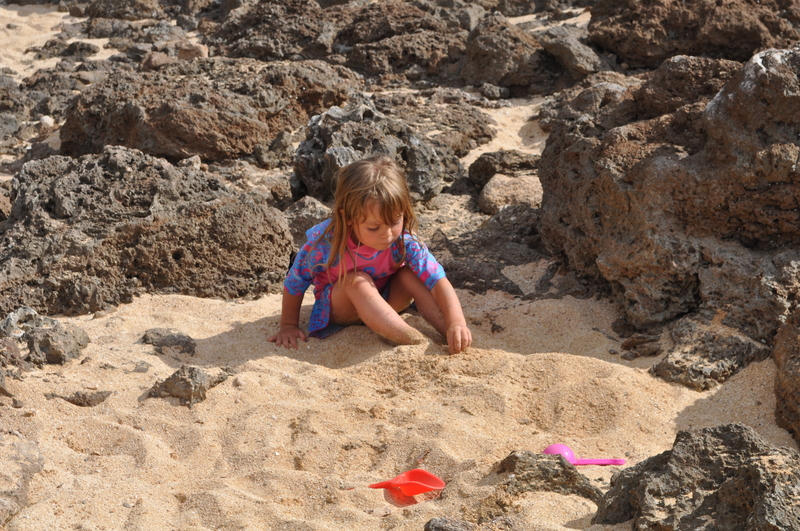 Like anywhere else in Hawaii the kids also love playing the sand to warm up after time in the water. 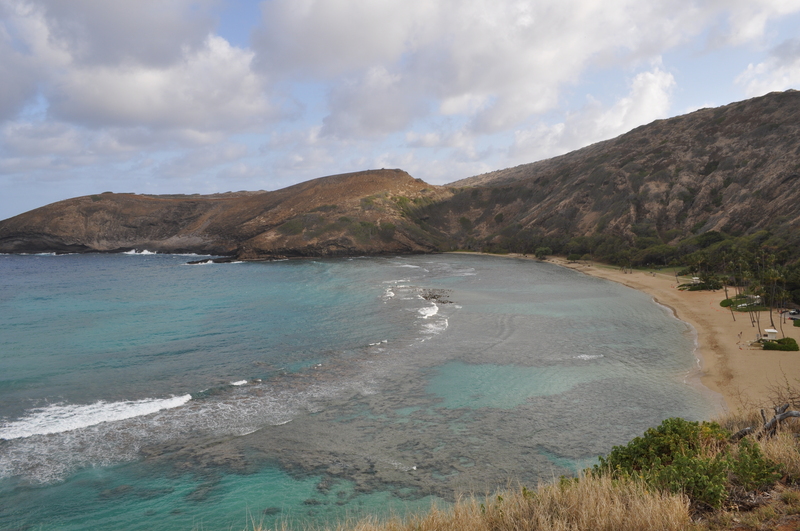 This time we snorkeled other areas of Sharks Cove and enjoyed larger fish. 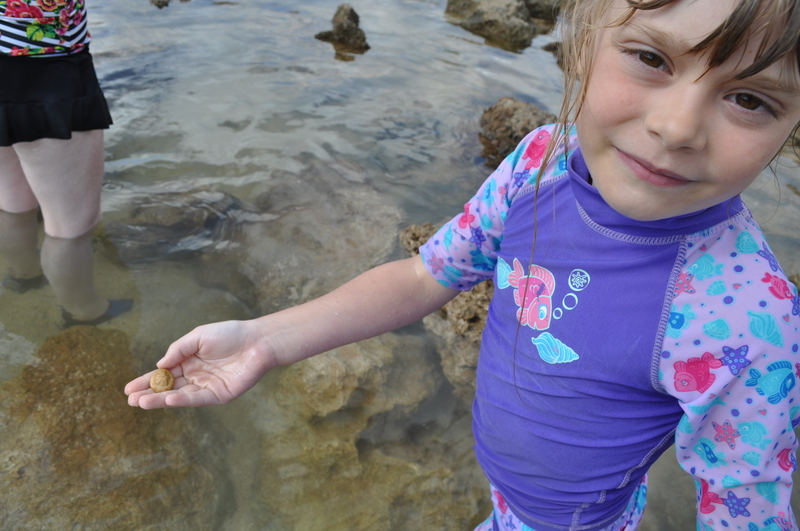 Isabella and I followed another coronetfish around while we also looked closer at the various species of urchin present. 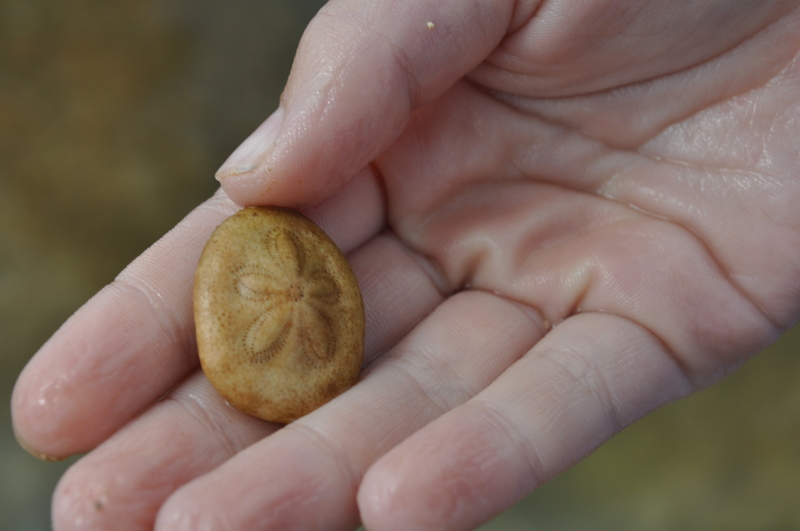 Sherrie even saw a brittlestar eating an urchin. 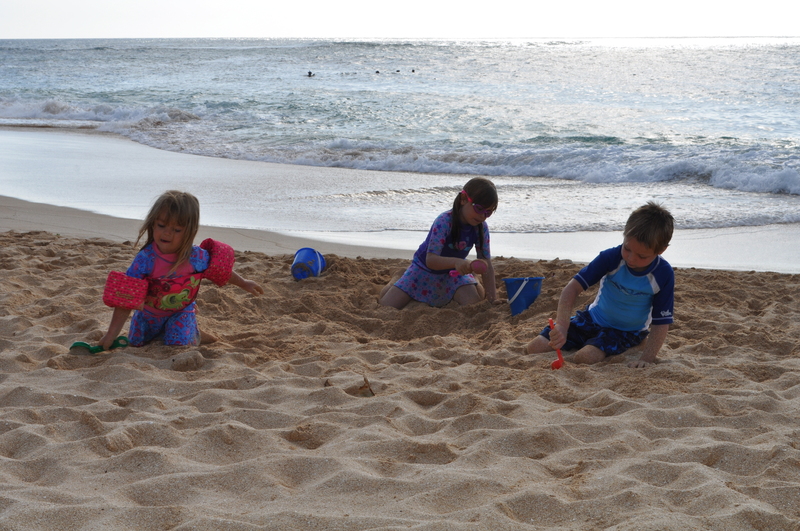 Of course, the kids love playing in the sand wherever they go and it helps them to warm up between times in the water. 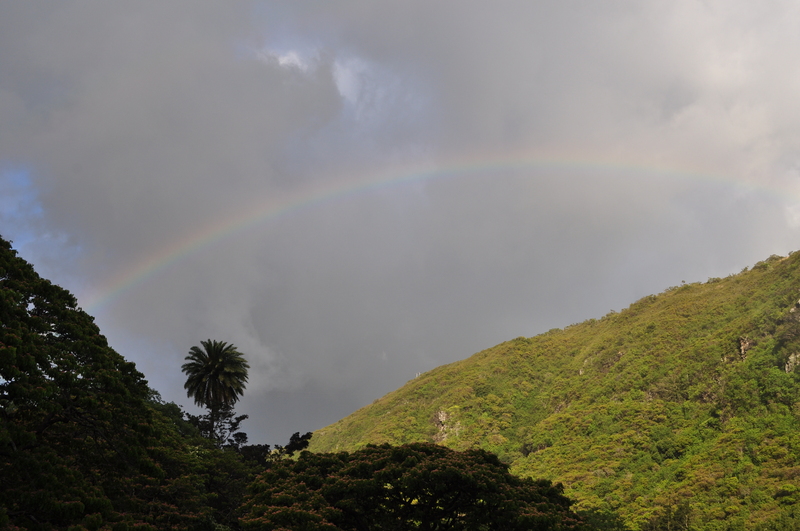 17 May 2015 – Hawaii has a unique and beautiful culture. Just like any other culture it has some very historic and sacred places which are lost amidst its natural beauty and the cacophonous tourist activity. 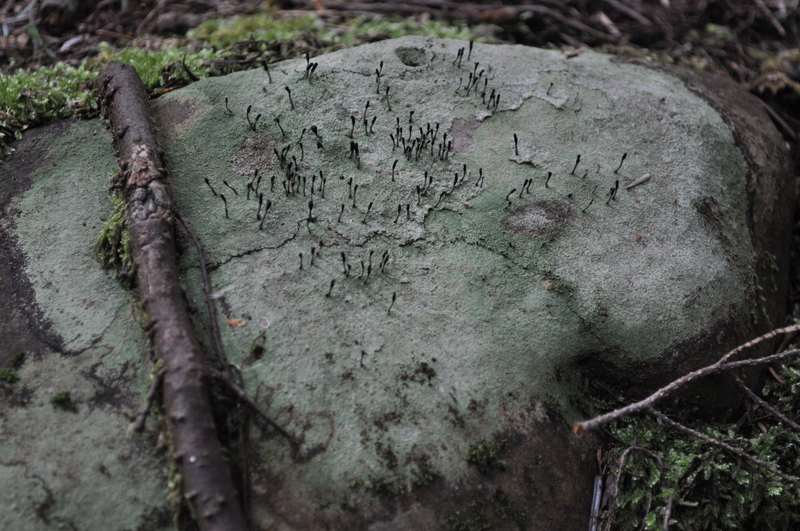 I’ve always wanted to visit the Kukaniloko Birth Stones due to their unique nature. 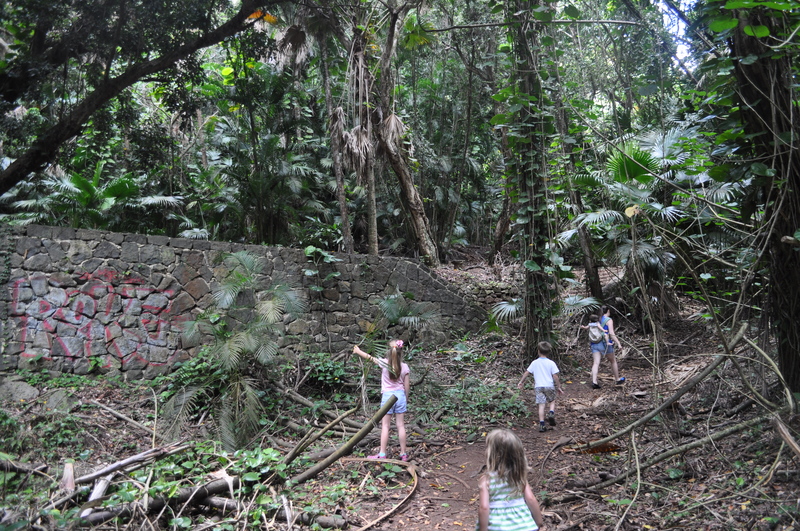 In Hawaiian culture Kukaniloko is a sacred place where the ruling class (the ali’i) would come to give birth to children in the line of royal succession. The birth would occur amongst the stones and be witnessed by the various chiefs (36 or more) to give an oral account of the birth. 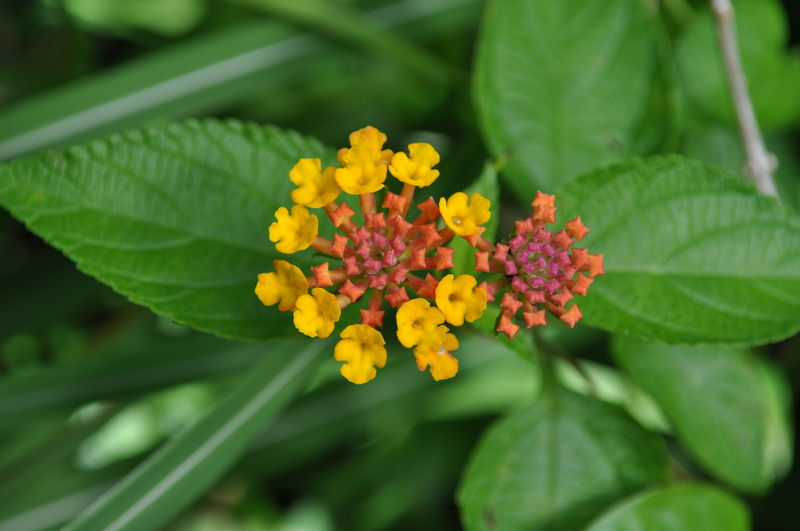 The birth was a sacred and very structured process overseen by the Kahuna – Hawaiian priests. The laboring mother was assisted by several others who took specific positions during the labor. 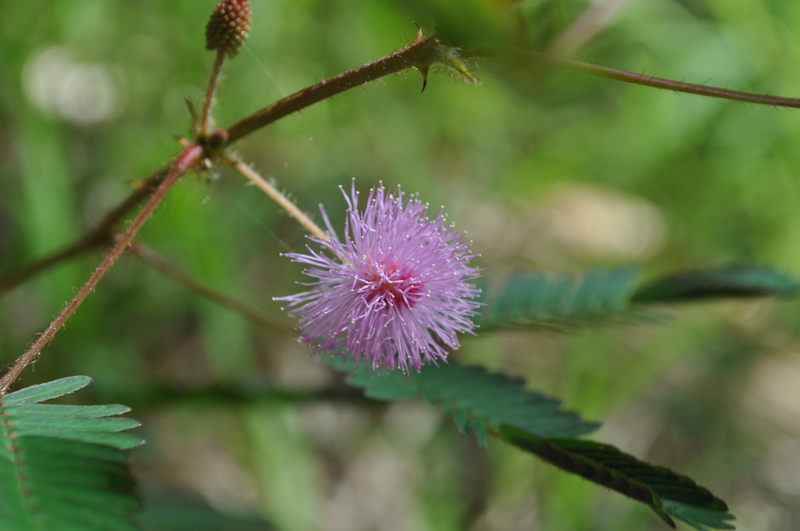 Supposedly the site was supposed to enable a painless labor and birth – yeah right. 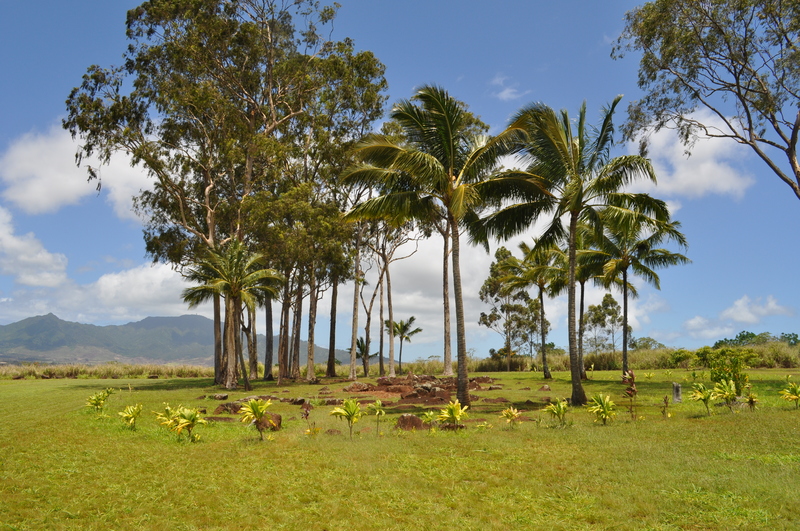 During the 600 year period of usage, about 1200-1800 CE, the site was guarded and only ali’i and Kahuna were allowed access. Only by the sounds of the drums announcing the birth was anyone else informed of the activities on the site. 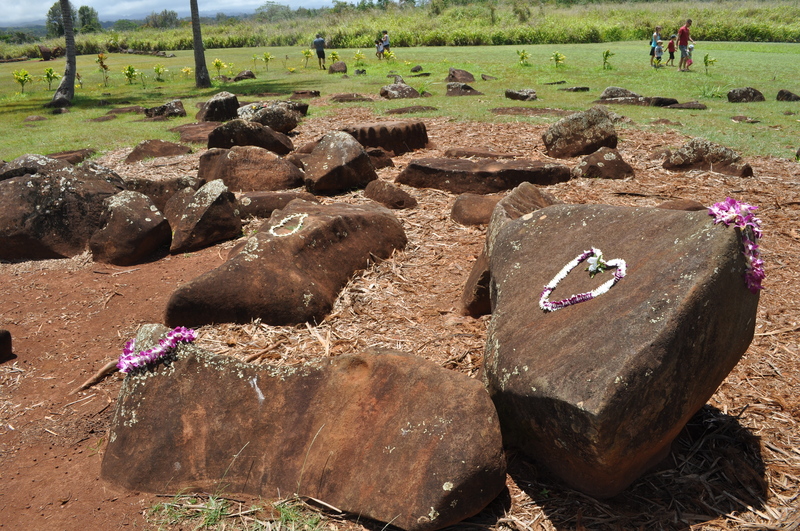 Today the site is still considered sacred by the native Hawaiians – however during the last 50 years was changed as stones were added or re-arranged. 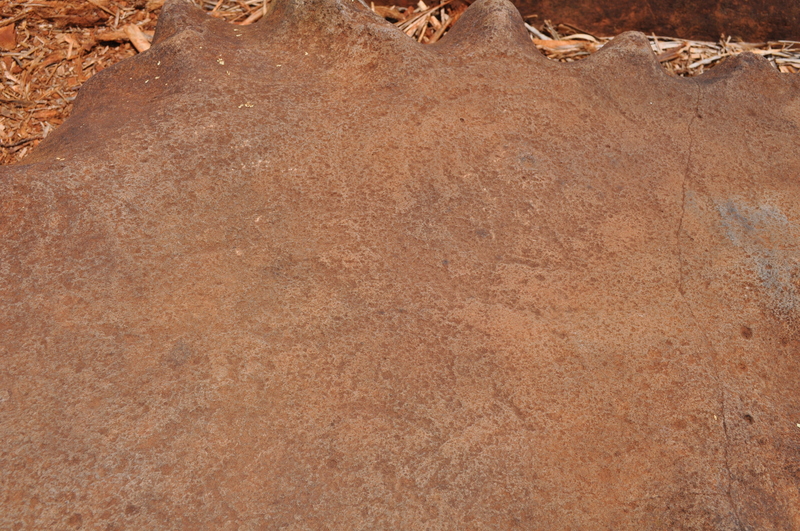 The original stones are easily identified due to the existence of petroglyphs, carvings, and man-made shapes designed for function – such as holding a bowl. 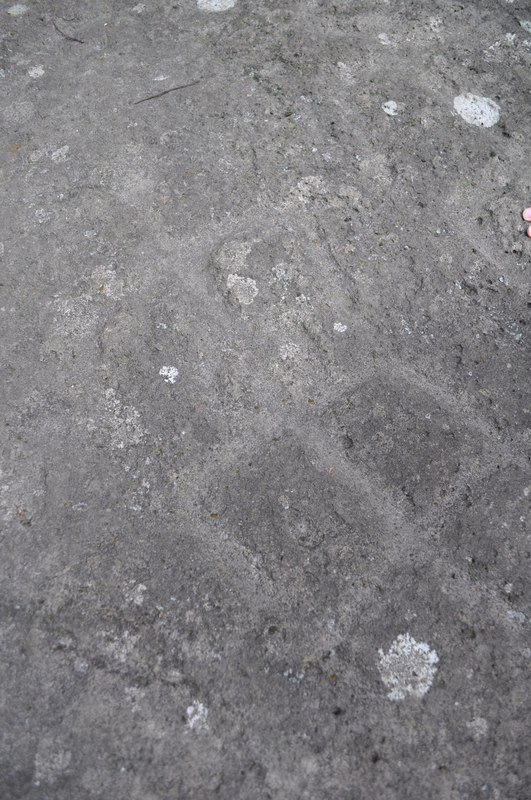 The entrance to the site is marked by two large monoliths and 36 smaller stones which make an avenue. 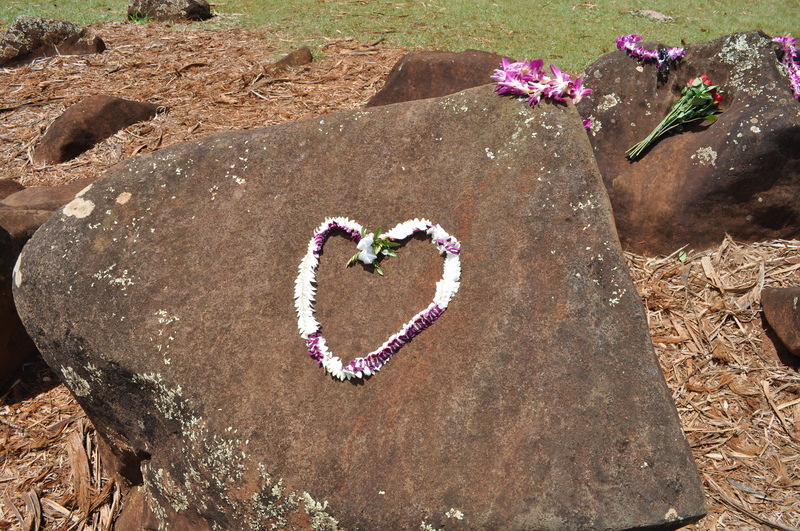 The 36 stones represent the 36 Hawaiian chieftains. 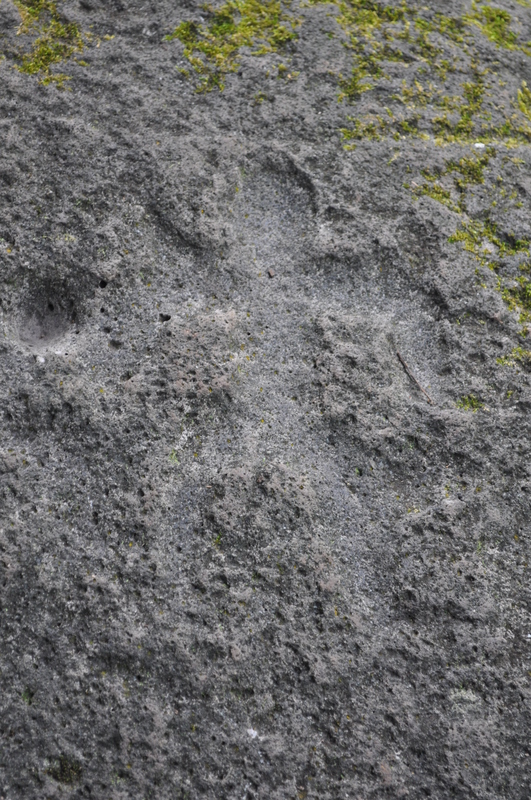 However, these stones were added after the site was no longer used. 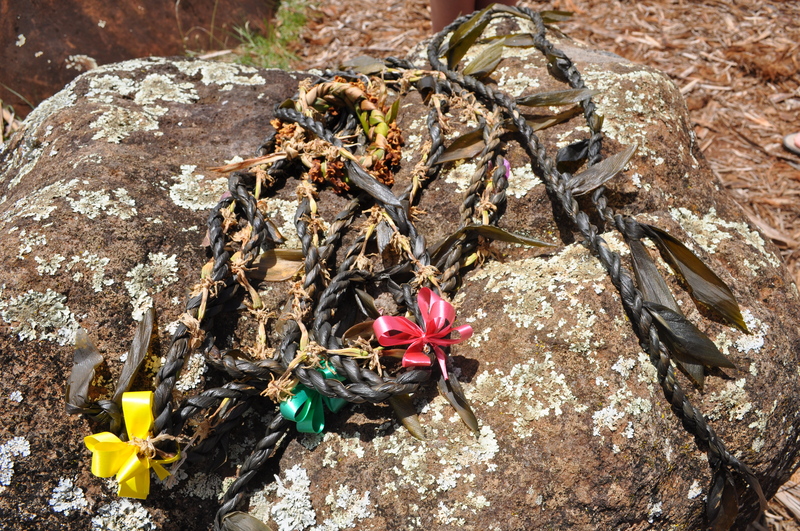 Visitors today bring leis to the site and lay them on the stones. 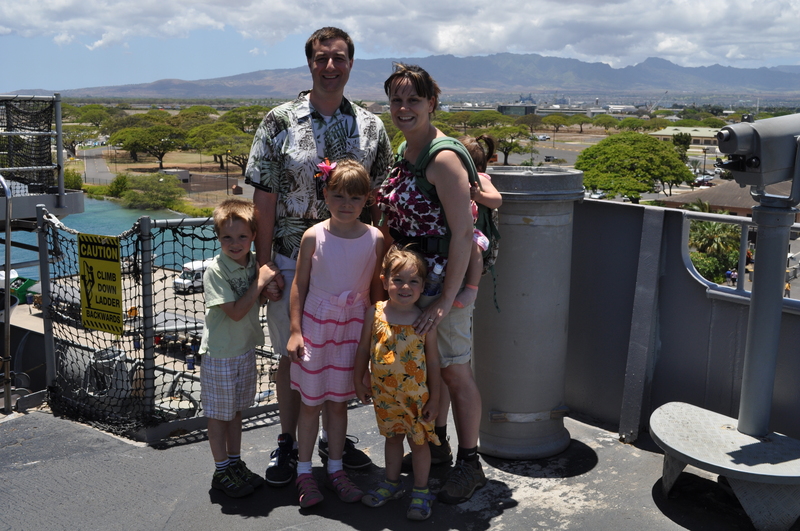 15 May 2015 – After visiting the USS Missouri we had to rush over to Waikiki to board a ship for a Pirate Adventure. 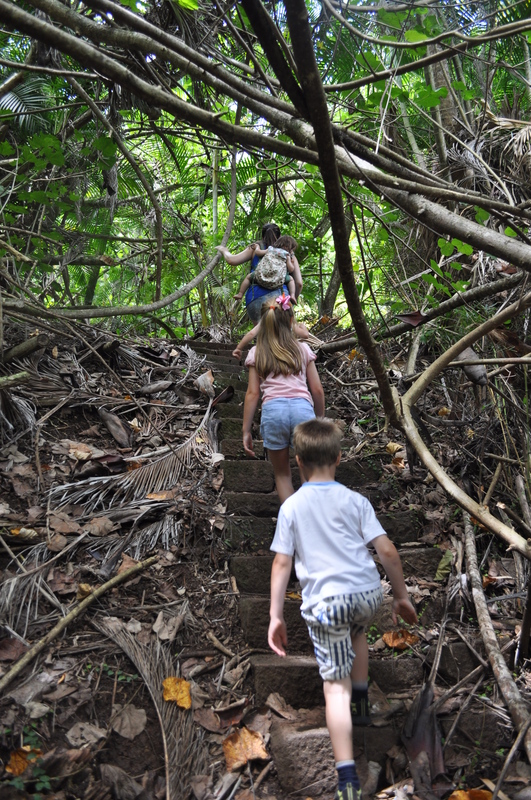 We found the Hawaii Pirate Ship Adventure by looking through a list of activities on the island and when we researched the reviews it was clearly a winner. 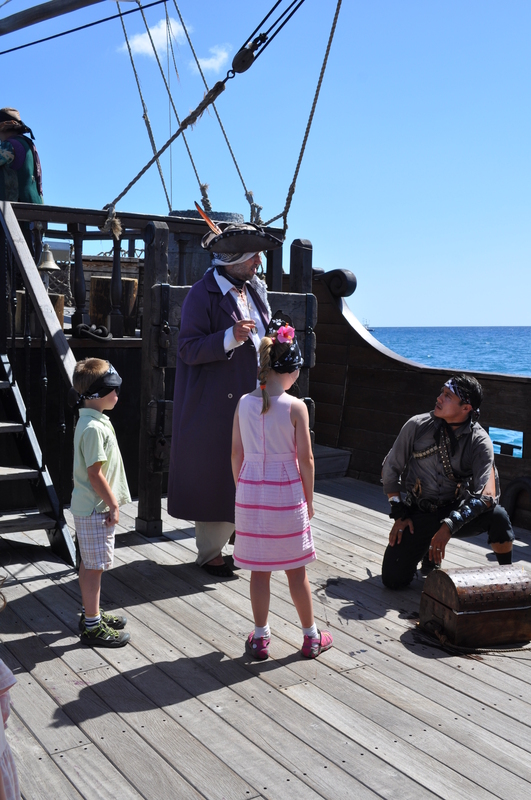 The ship is well decorated to look like a prototypical pirate vessel and the crew is dressed and in full character throughout the adventure. 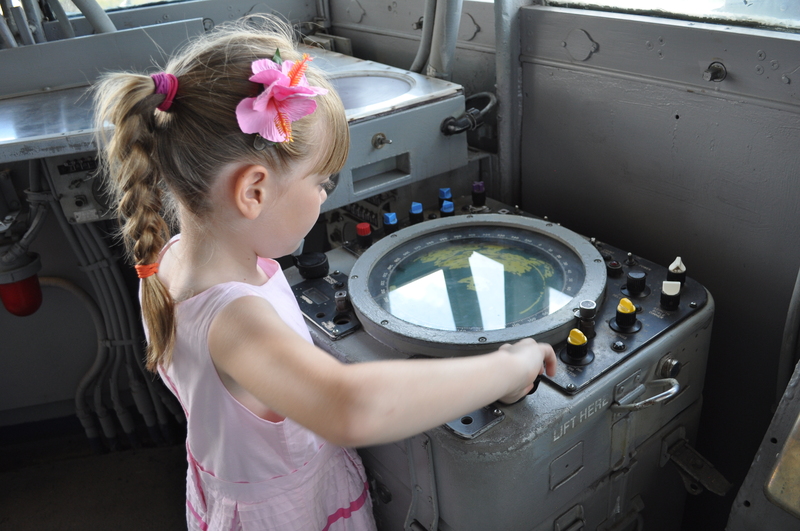 They cater mostly to the children but the adults get involved as well. 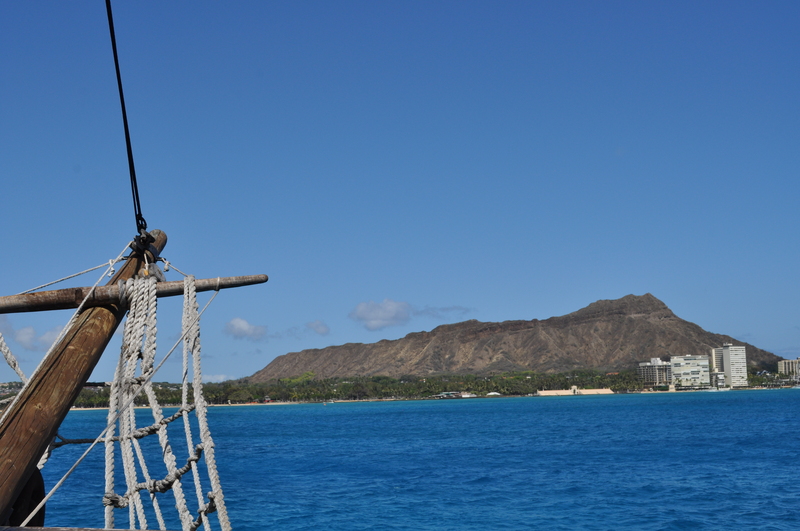 The ship travels along Waikiki towards Diamond Head where it turns around and heads back. 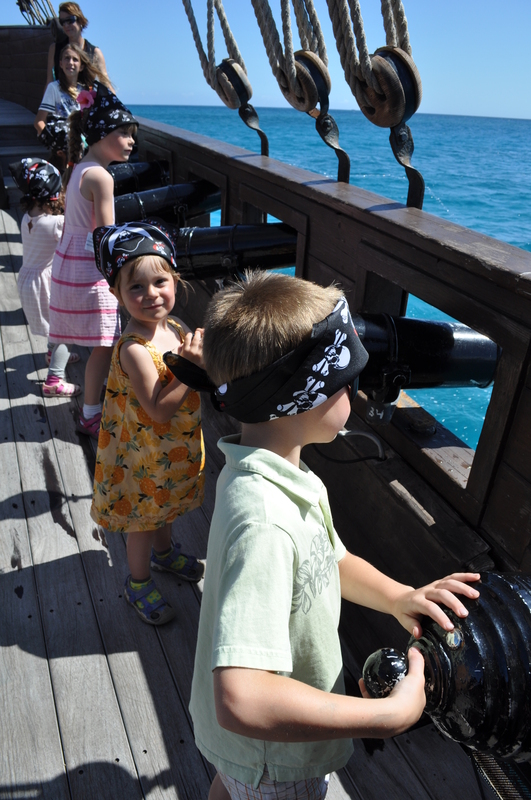 As we encounter enemies (e.g., other vessels) along the way we man the cannon and do our pirate thing. 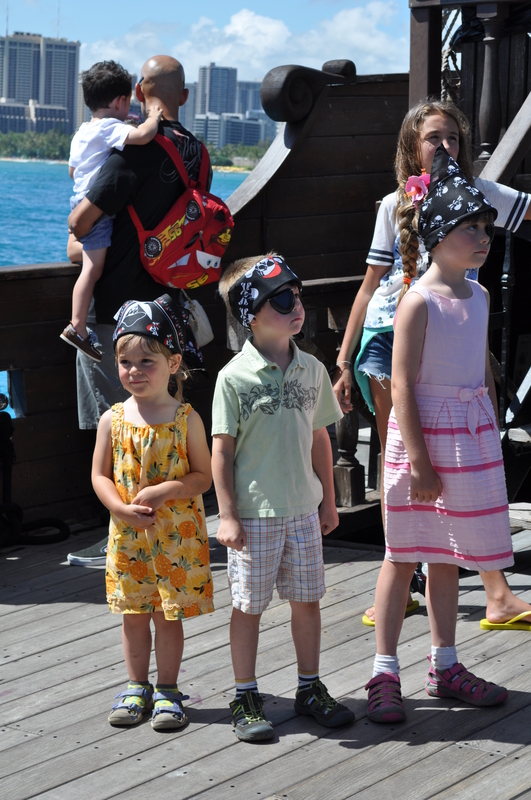 Once aboard the kids adorned their pirate gear (an eye patch and bandana) and got to explore the ship. 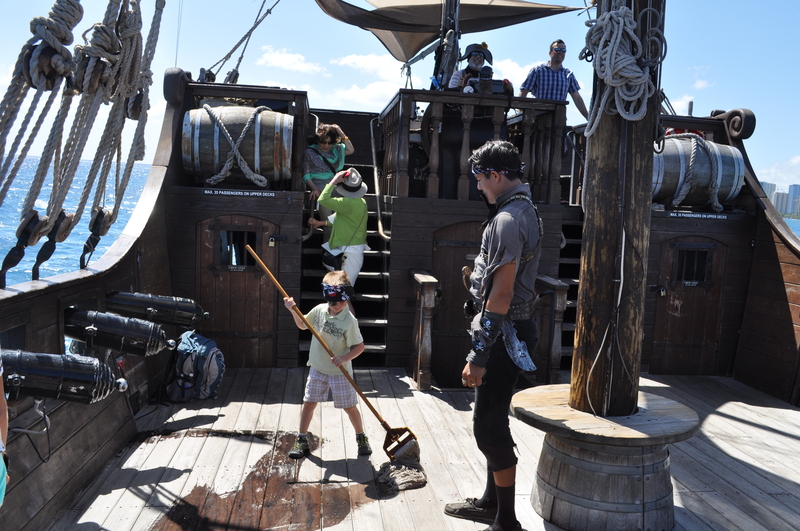 Then, they put them to work swabbing the deck and instructing the new crew on ship terminology. Then, the crew learns to fire the cannon – which are air-pressure powered water cannon. They don’t fire far but the kids loved it. Of course, when another ship passes close enough the real crew pull out larger water cannon and fire for greater effect. 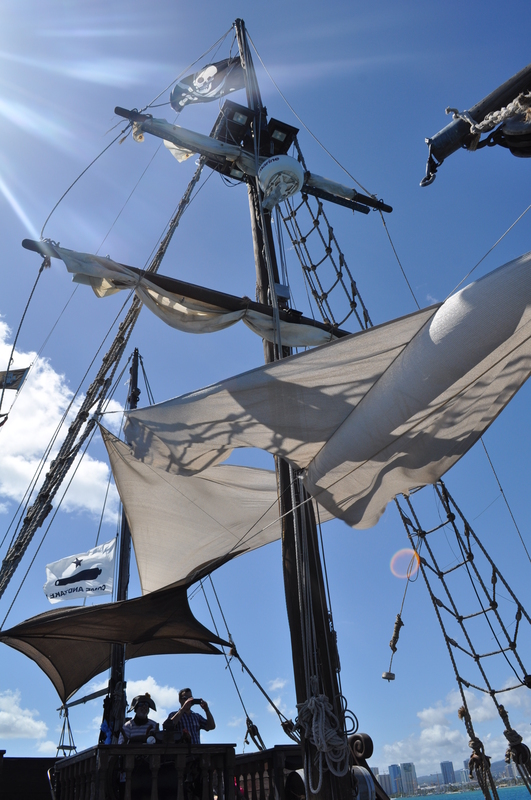 It was obvious that other tour ships in the area pull in close to the pirate ship for the benefit of their customers as well. Further into the adventure the ship goes to look for treasure – a treasure box floated with buoys which was placed previously. They (unsuccessfully) attempted to get me to tie myself to a hook and hang overboard to retrieve the box from the sea. Luckily they had a hook on hand and the entire crew worked to pull the box up out of the sea. 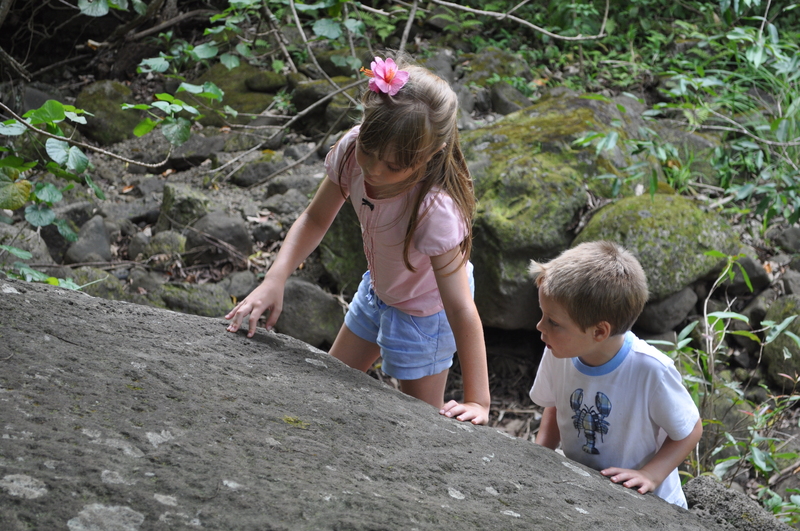 The kids then helped find the key for the treasure box. 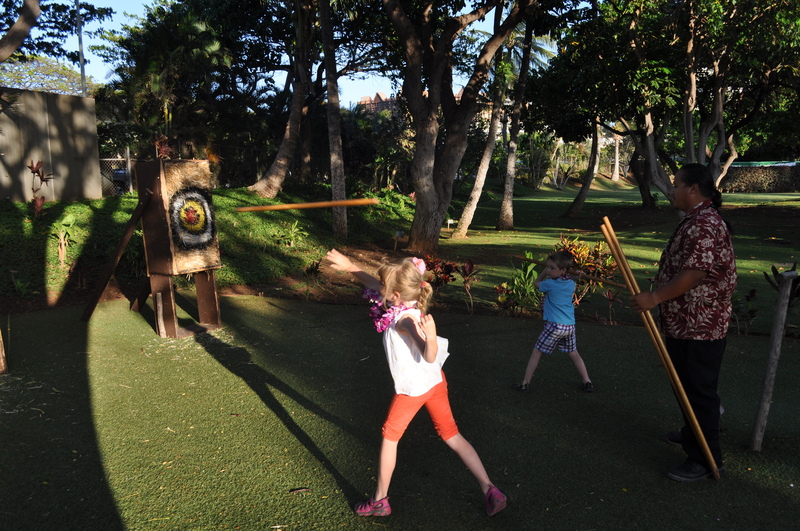 Finally, the kids learned to sword fight and toss a skull through the stocks in a macabre pirate game. 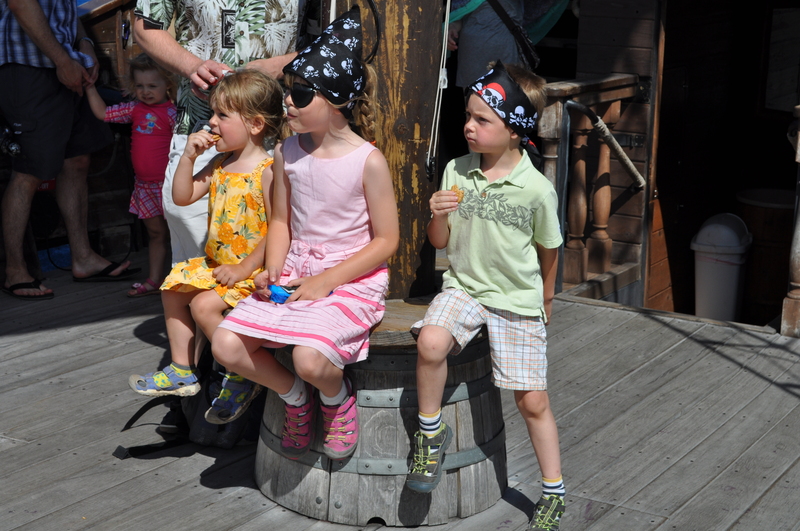 Finally the children were “branded” as pirates and graduated. 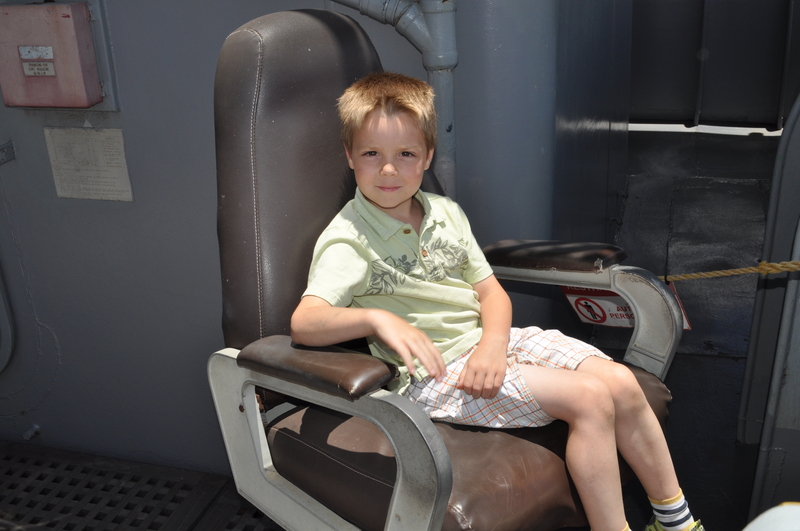 The 90 minute adventure was excellent and a highlight of the trip for the kids. 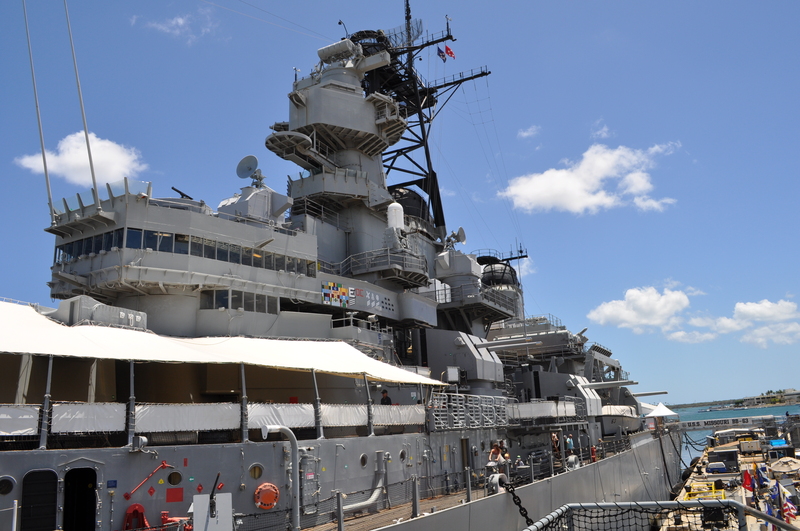 15 May 2015 – We left early towards Pearl Harbor to visit the USS Missouri. 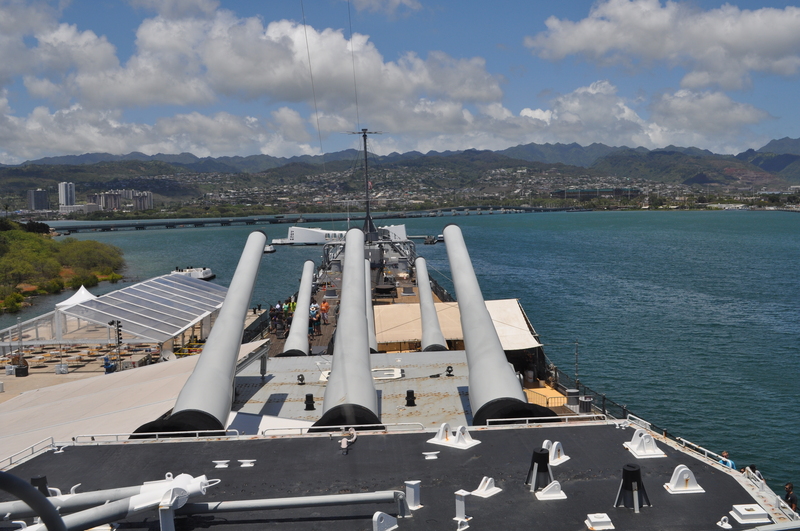 While we had seen the Arizona Memorial we had never visited the USS Missouri sitting right beside the sunken Arizona. The battle of Pearl Harbor has always been personally significant as my grandfather was stationed on the carrier USS Enterprise at the time. During the attack the USS Enterprise was out at sea and part of the critical protection of Hawaii after the attack. However, if the Enterprise had not been out at sea that day and instead at port – I may not be here writing this post. 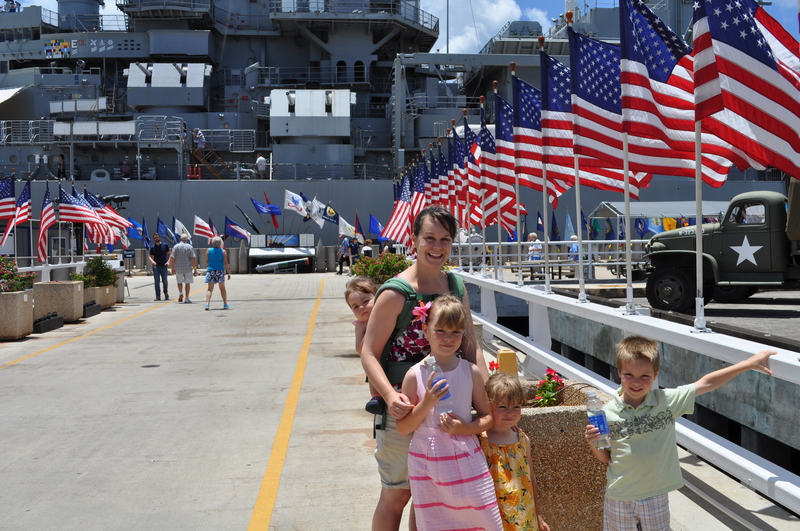 The tour begins with a bus ride out to Ford Island and a short walk to the Missouri where there they funnel all visitors past the commemorative photo opportunity. However, they did get us with the sale of our photo in a magnet as we’re magnet collectors. 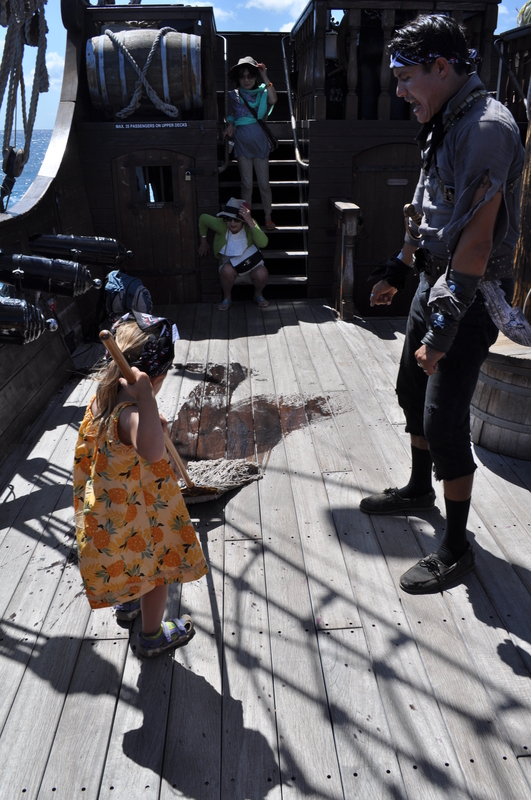 We only had 1.5 hours before we needed to leave to our next adventure that day – the Hawaiian Pirate Adventure. 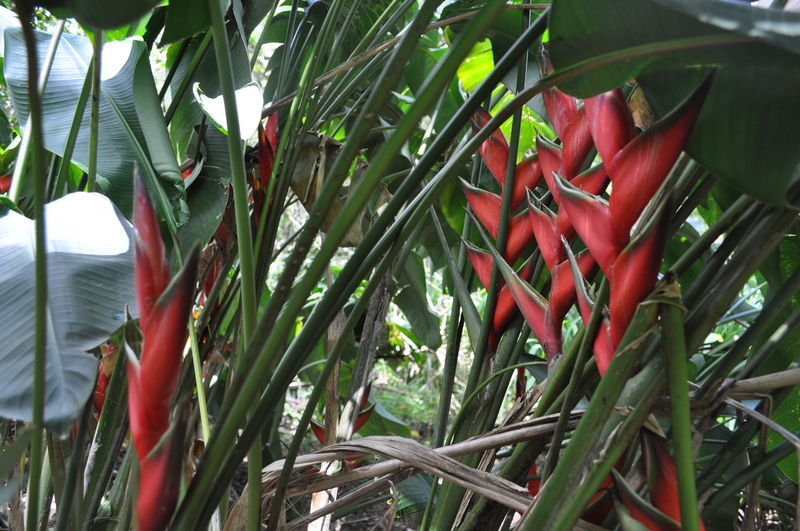 We decided to follow-along with the 35 minute guided tour – which was very informative and worth the time. 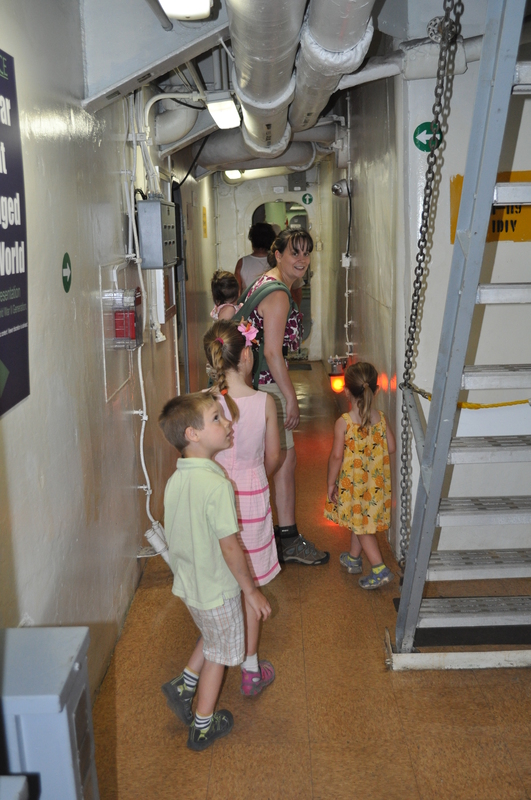 The tour took us along the main deck discussing the history of the ship and various points of interest. 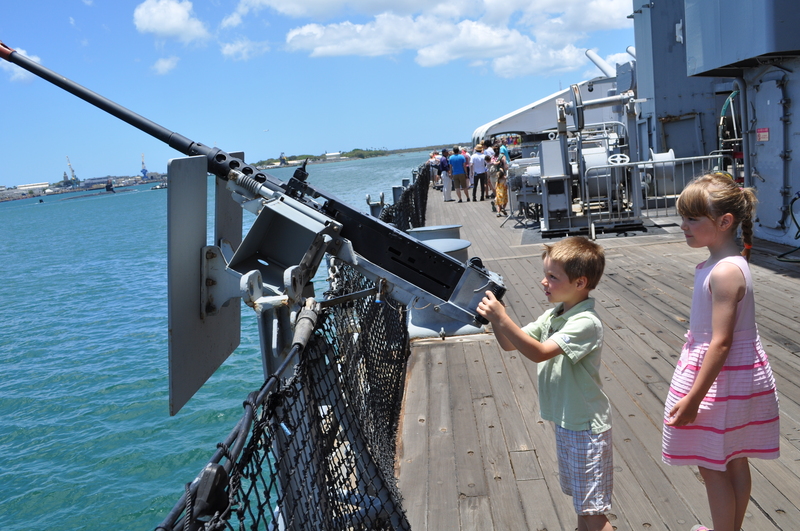 Lucas was very interested in the various deck guns along the rails. 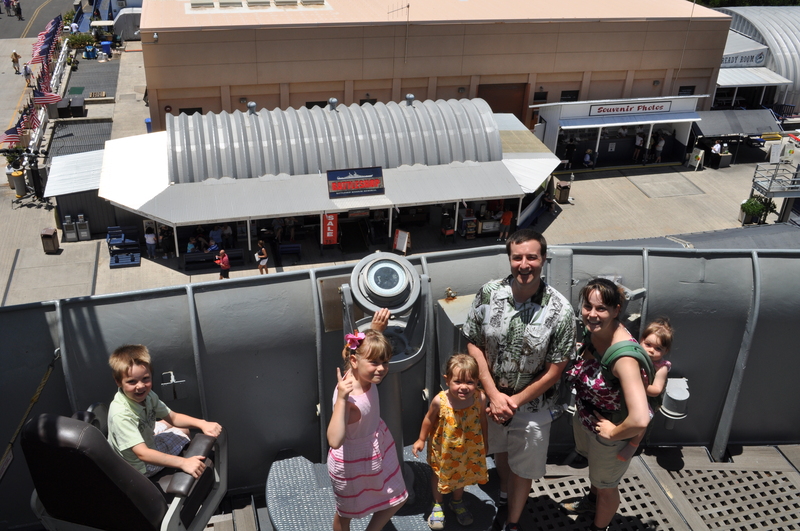 The tour took us up to the surrender deck – the most historic point on the ship and one of the most historic events in US history. 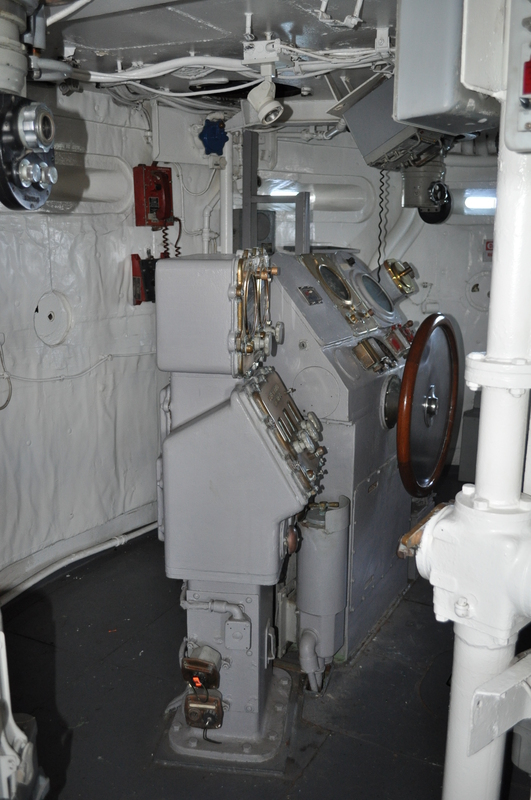 I was surprised at the small size of the deck given the number of dignities and others present – as the tour guide pointed out, there was not much room for everyone. 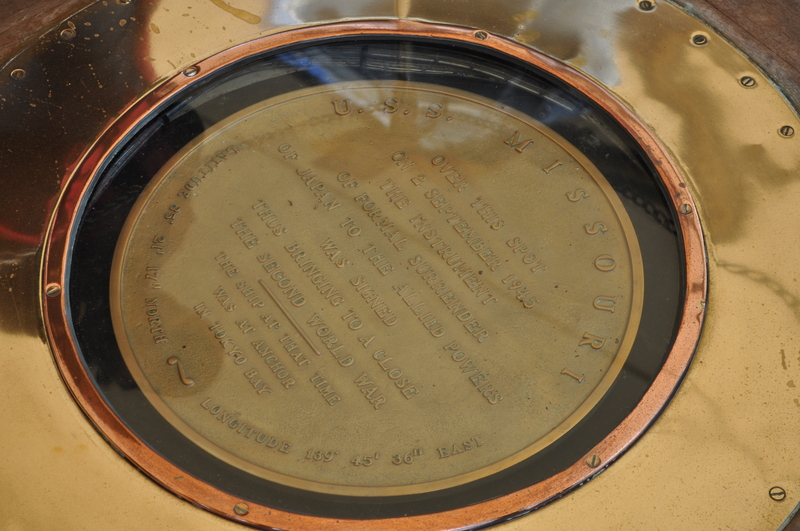 There is a brass plate embedded in the deck where the table sat along with copies of the surrender documents to examine. The table is now at the US Naval Academy in Annapolis – which Sherrie and I had seen before in our travels on the East Coast. The tour led us further back to the stern of the ship to where the ship was struck by a kamikaze pilot and highlighted the burial at sea afforded the Japanese solider. I felt both the tour guide and the other exhibits on board over-played the honorable actions of the ship’s crew towards the kamikaze pilot, including sewing a rising sun flag for the funeral. I was thinking, of course that is what should happen, why brow beat us with that event? But then on further reflection on the Japanese treatment of US POWs which was torture followed by execution, I saw that the purpose was to promote US values of treating POWs with respect and provide a historical counter-point to the Japanese position at that time. 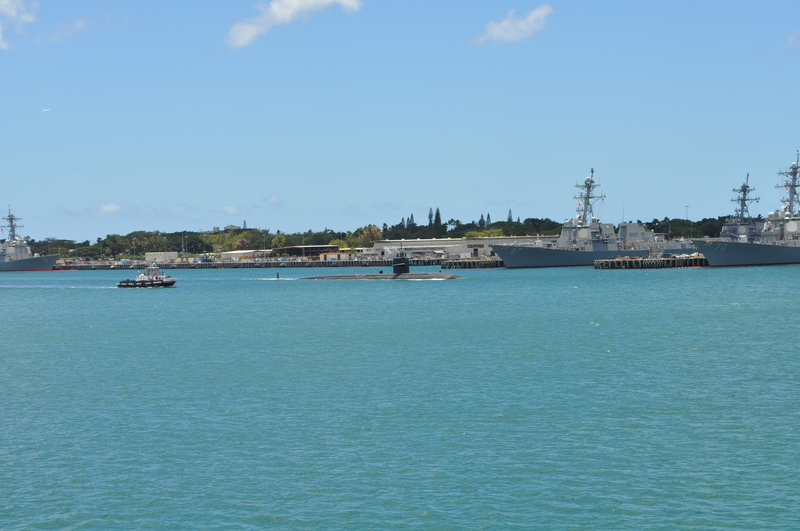 We were also very lucky to witness a submarine being towed to sea out of Pearl Harbor which passed right near the USS Missouri. 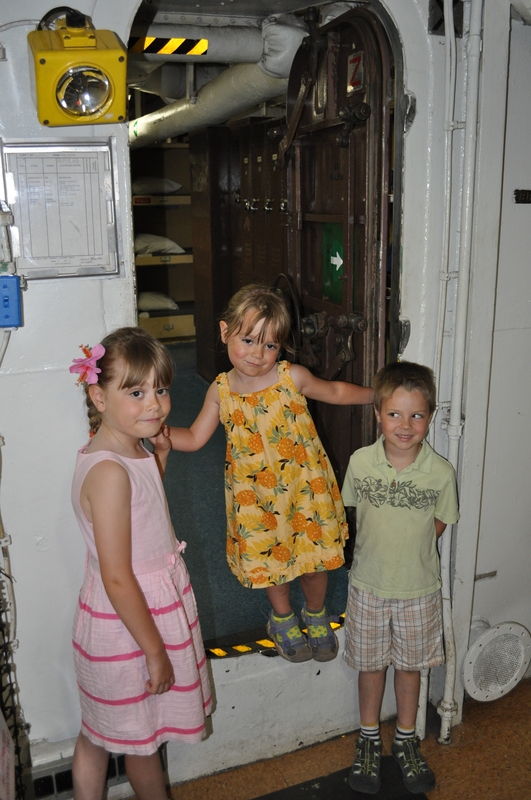 After the tour we headed below decks and explored the maze of corridors and rooms which were very well documented. 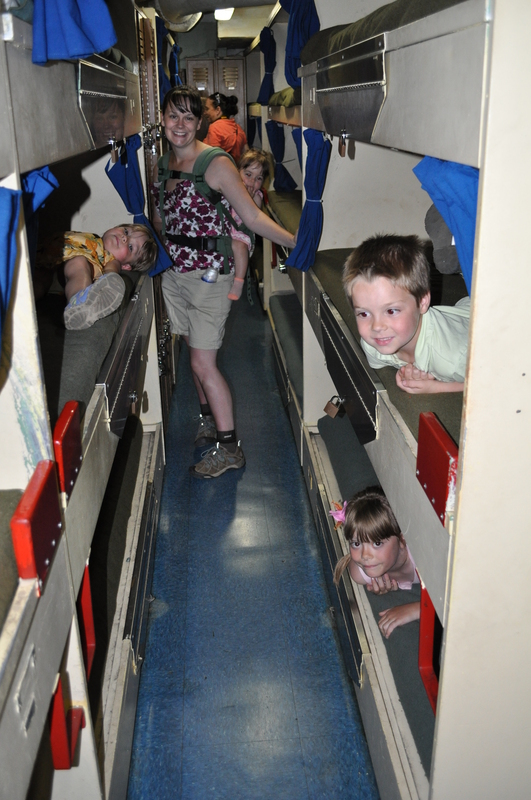 The kids loved seeing the kitchens and the bunks. They were also impressed by the Chief’s mess and lounge – with a television. After a 20 minute walk below decks we headed up to the bridge. The views are great from above but there was much less of the ship to see. I noted the various compasses at multiple points and the bunker-like bridge surrounded by a circular steel wall almost a foot thick. 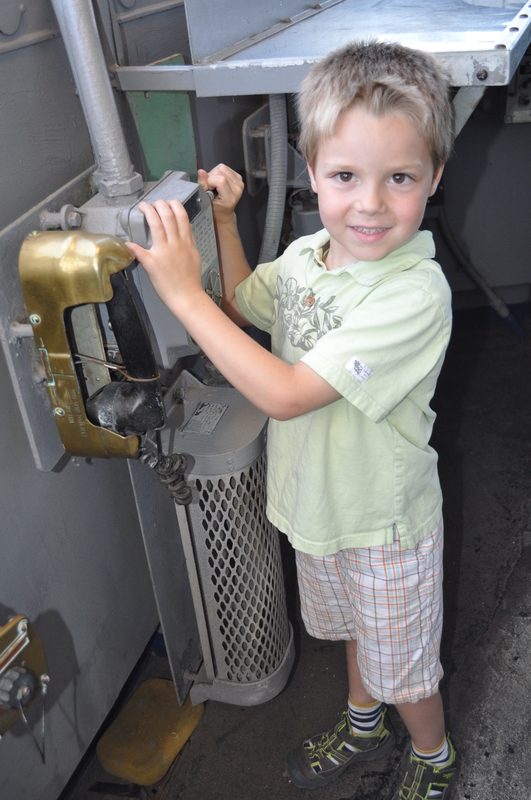 The kids exploring all of the instruments including the phones and radios. We then headed down from the bridge but not before a few more photo opportunities along the way. Unusually, two different people offered to take our family picture – an offer we never refuse since it happens so rarely. 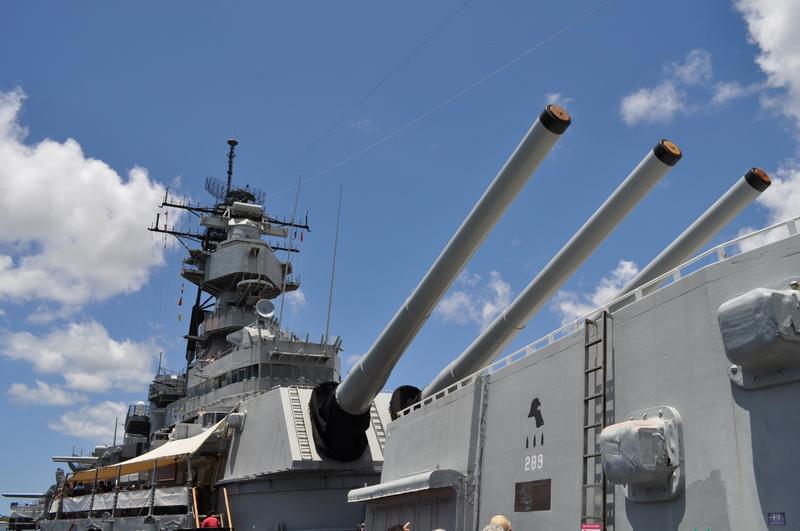 The visit to the USS Missouri was excellent and the kids really enjoyed the experience and learned a lot about war, history, and how military ships operate. 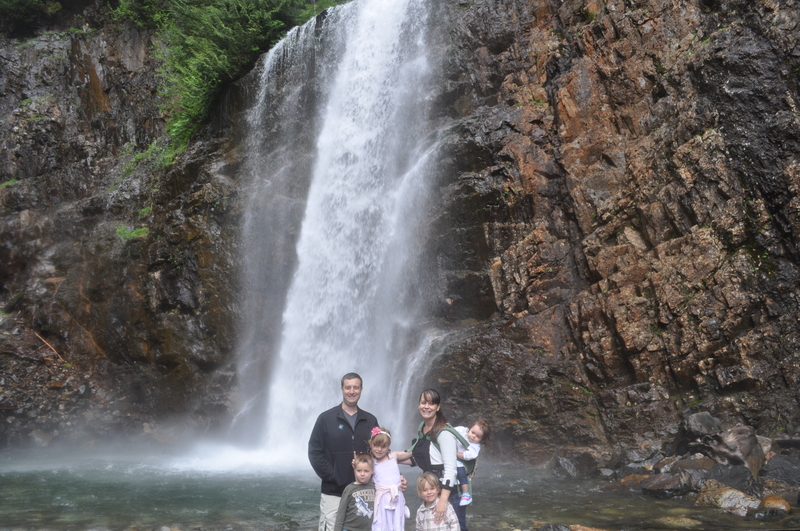 14 May 2015 – Our friends generously offered to host our oldest three children at their house for a few hours while Sherrie and I went out. 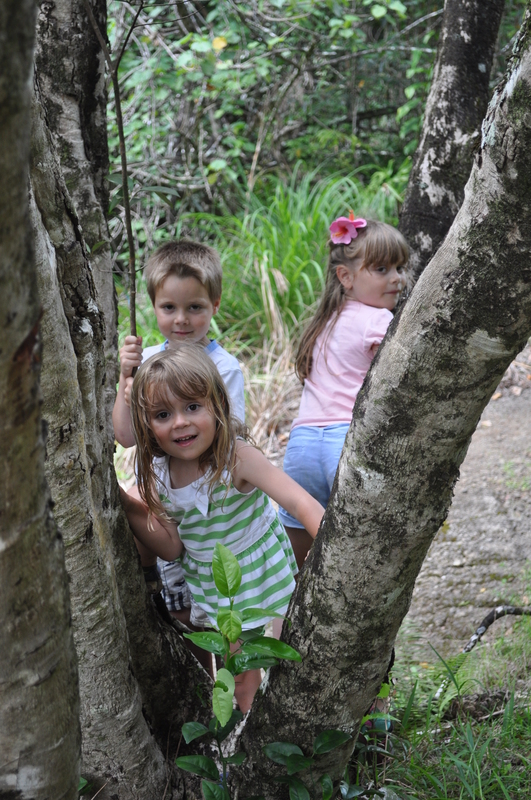 The kids had a great time playing with the other children and visiting a splash park. 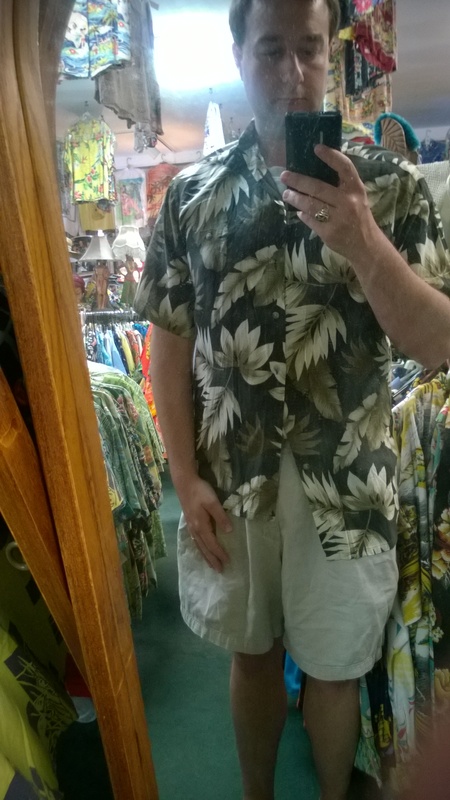 Meanwhile Sherrie and I went out into Honolulu to visit the best Aloha shirt store in the world – Bailey’s Antiques and Aloha Shirts. Every time I visit Oahu I go to Baileys and pick up a few new shirts off their used racks. They have over 15000 shirts dating back to the 1940s with both new and used. The used are spectacular deals – usually costing less than $20. 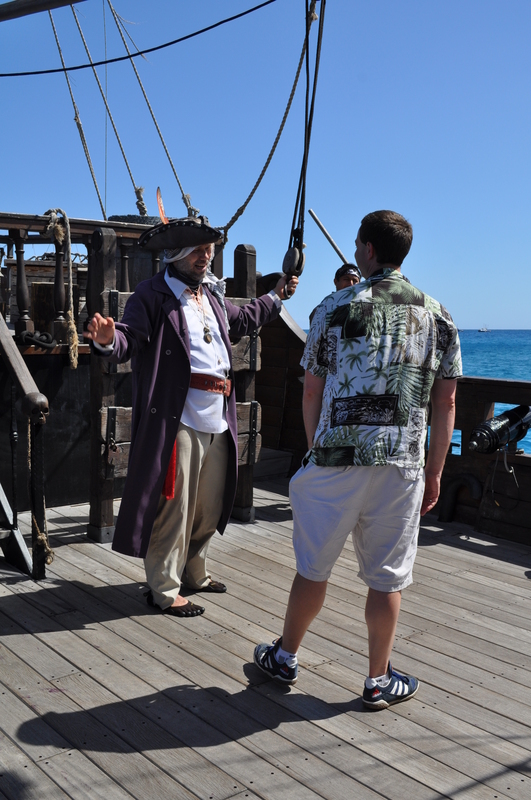 Big name such as Tom Seleck, Jimmy Buffett, Nicolas Cage, and Anthony Bordain shop there for vintage shirts. As usual, I chose more shirts than I intended, but the owner gave me a great discount on top of what I already consider a great price. 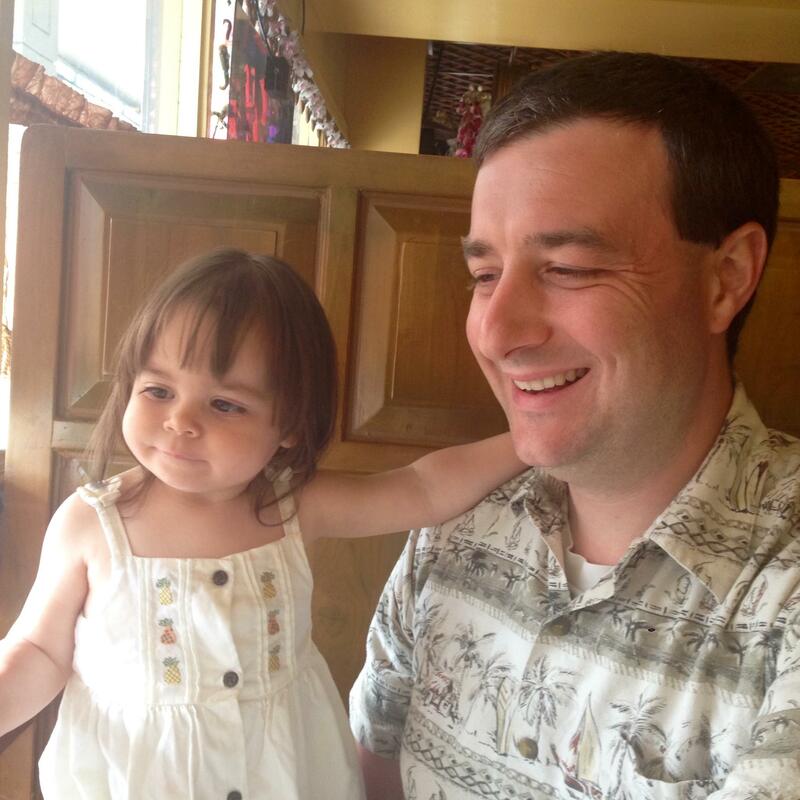 After updating my used Aloha shirt collection 🙂 we headed to a nearby Thai restaurant for lunch on the suggestion of friends – remember when I said Sherrie was always on the look-out for the next great Asian restaurant? 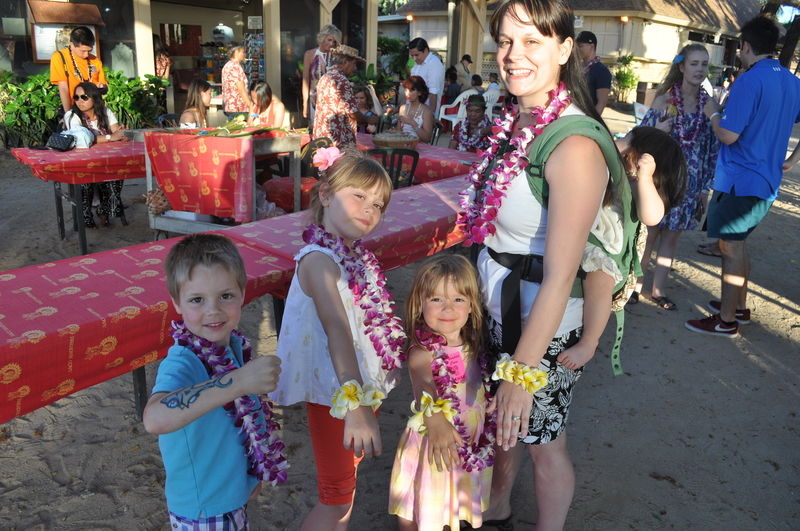 This time it was Siam Garden Café in Honolulu off Nimitz Hwy. 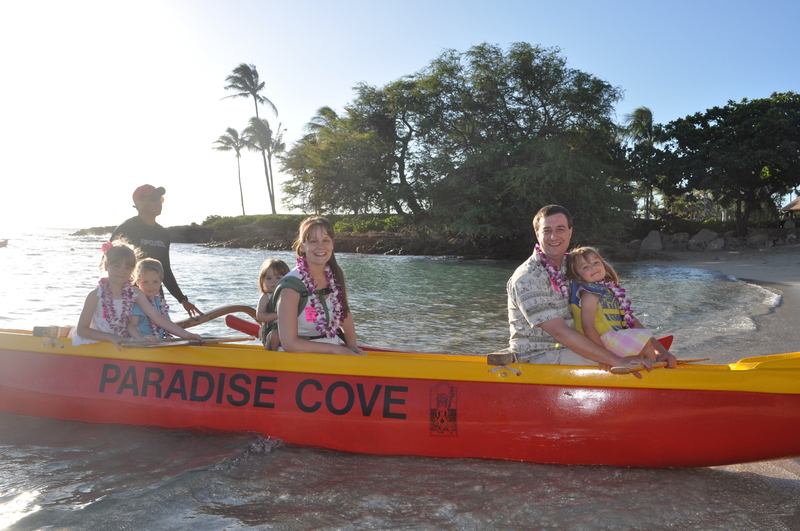 With lunch over we picked up the kids and headed to the Paradise Cove Luau! Due to traffic on the H1 we got there on time but a bit later than we wanted. 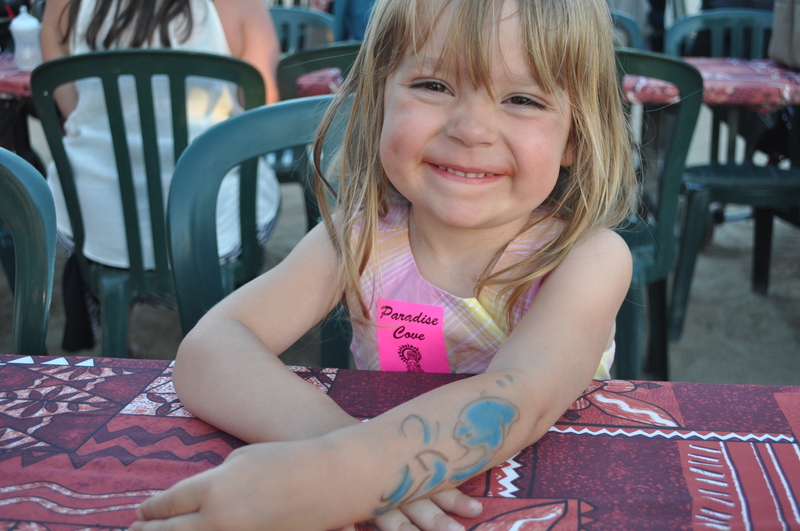 Paradise Cove is noted as being particularly child-friendly. 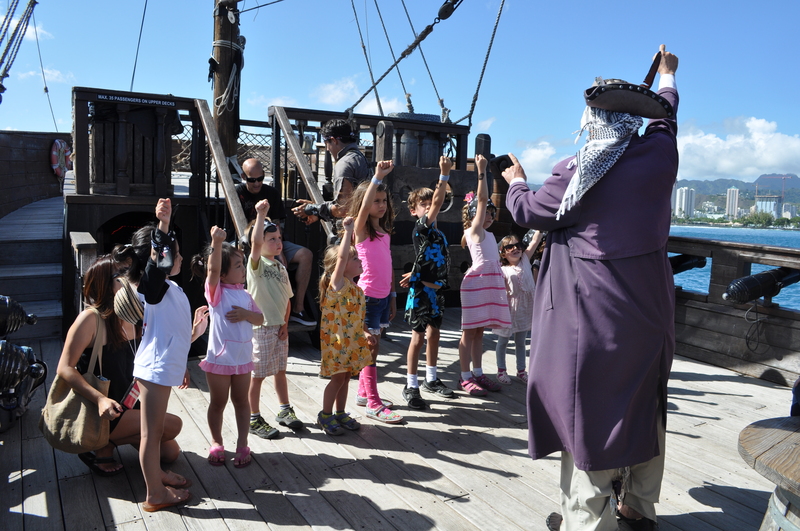 The program begins at 4:45 with activities such as spear-throwing, a ride around the cove in a canoe, flower-bracelet making, oil pencil tattoos, and pictures with parrots. 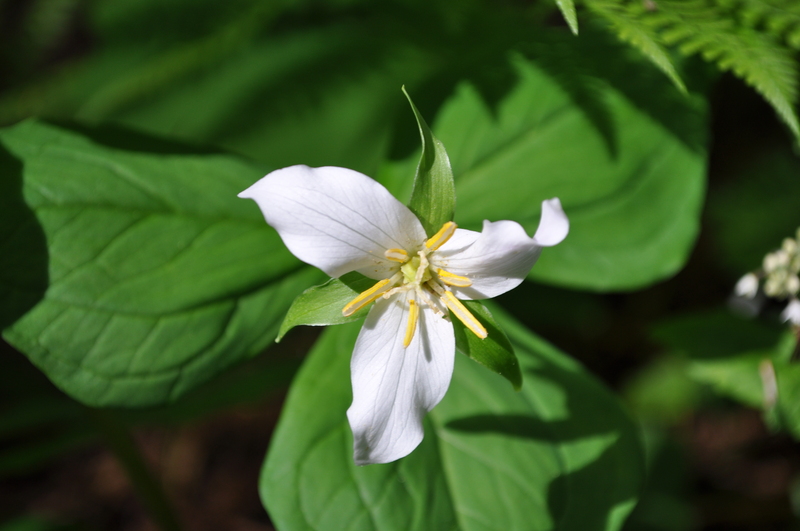 We hit the canoe riding first, then spear-throwing, and finally flowers and tattoos. 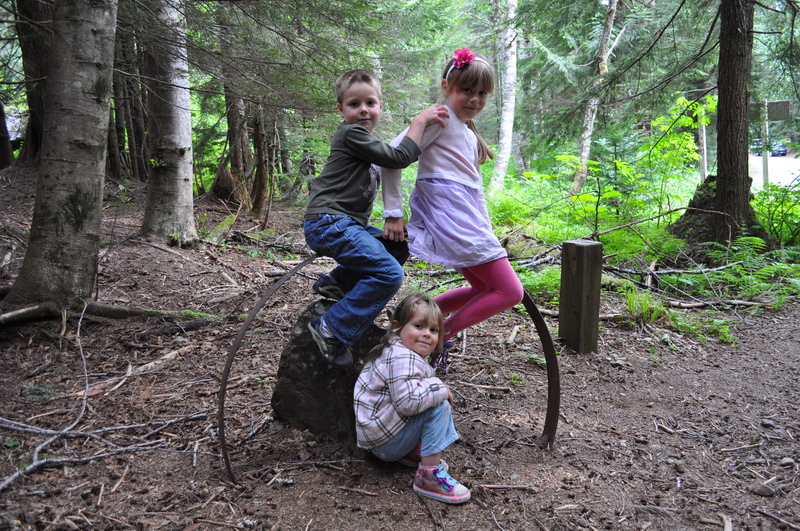 The kids loved the activities. Lucas and his tattoo artist, Umi from Samoa. Lucas wanted a shark. 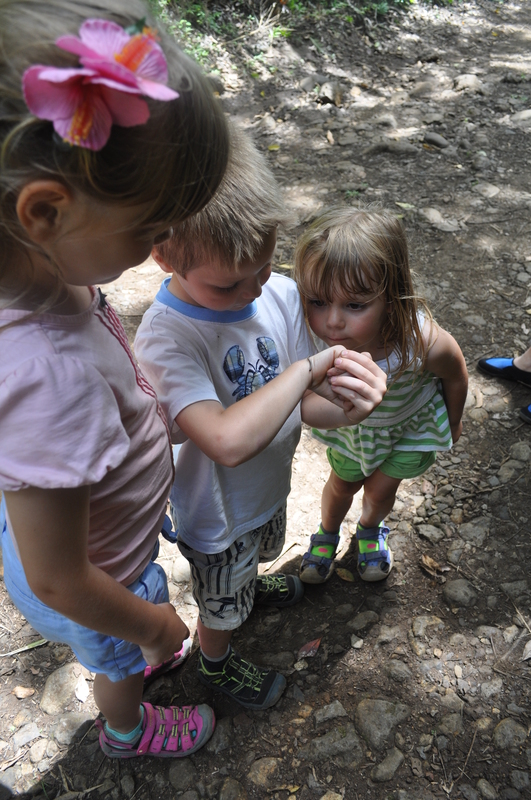 Lucas shows off his tattoo while the girls, Isabella, Aurelia, and Sherrie, show off their new flower bracelets. 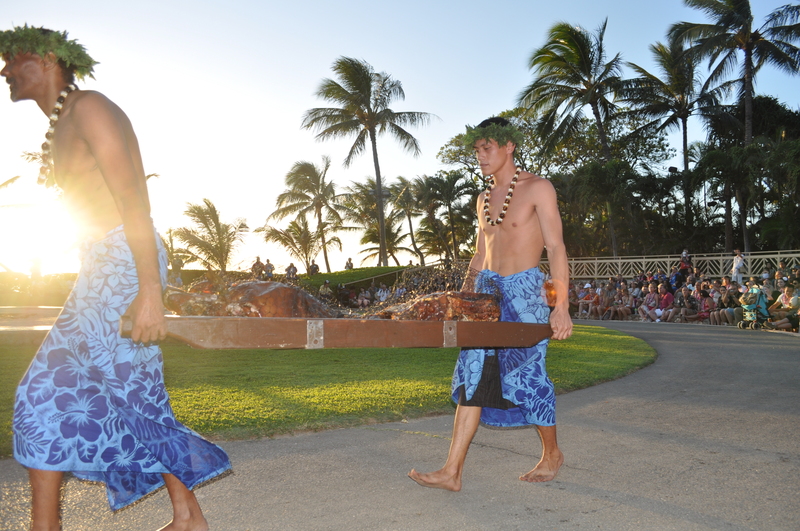 Then the show began with the unearthing of the Kalua pork. While the pork was prepared there was a short preview of hula and then off to get our seats for dinner – Sherrie went on an adventure to get drinks at the bar. 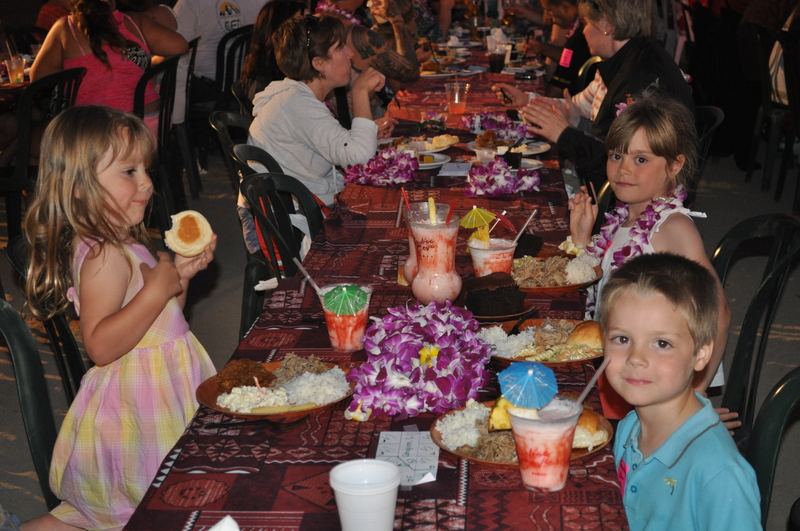 Dinner was pretty standard luau menu as was the quality: Kalua pork, fish, rice, poi, bread rolls, and (a non-standard) fried chicken. 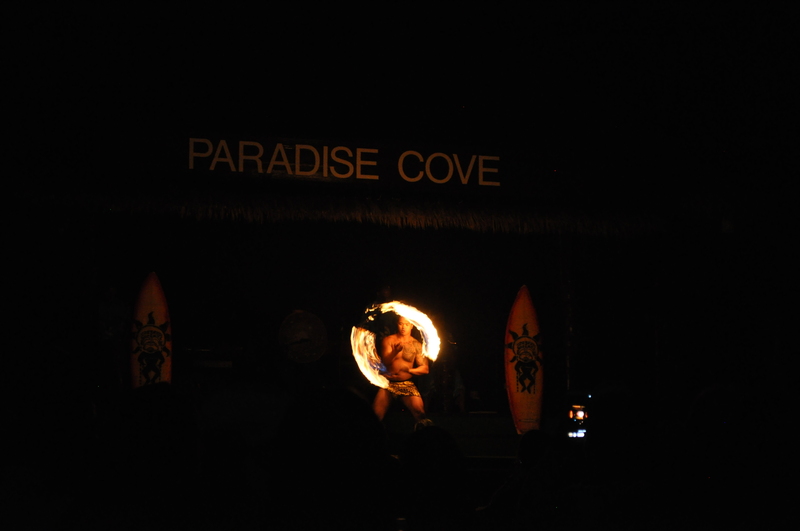 The show began right after dinner with dancing styles from Hawaii and Tahiti and the fire dancing – which the kids loved. 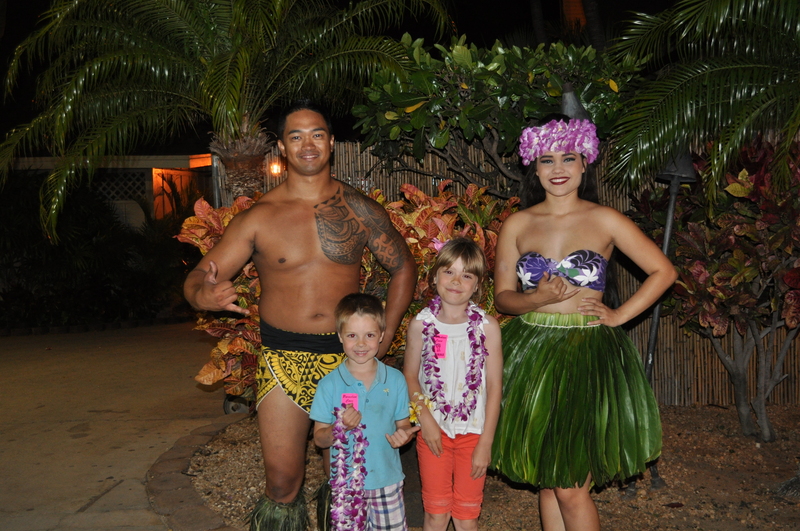 The kids even went on stage to learn the hula. 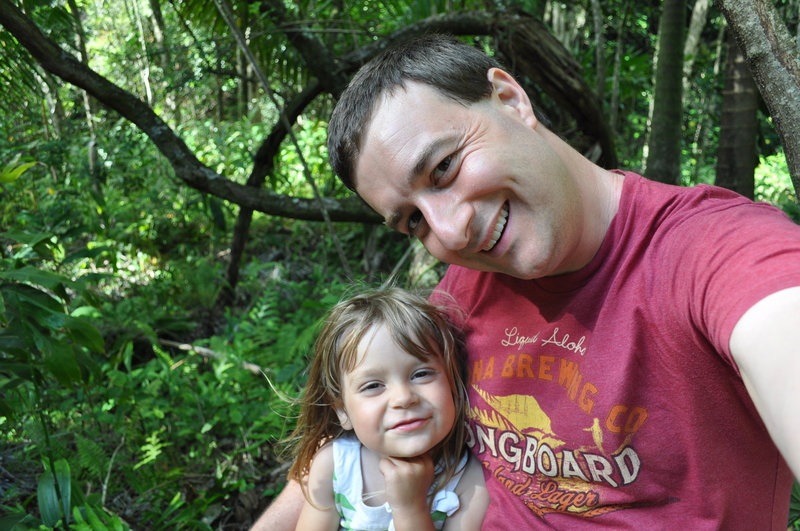 13 May 2015 – After a late start to the morning to allow Giuliana to take an early nap we packed up a lunch and headed to Hanauma Bay for some world-class snorkeling. 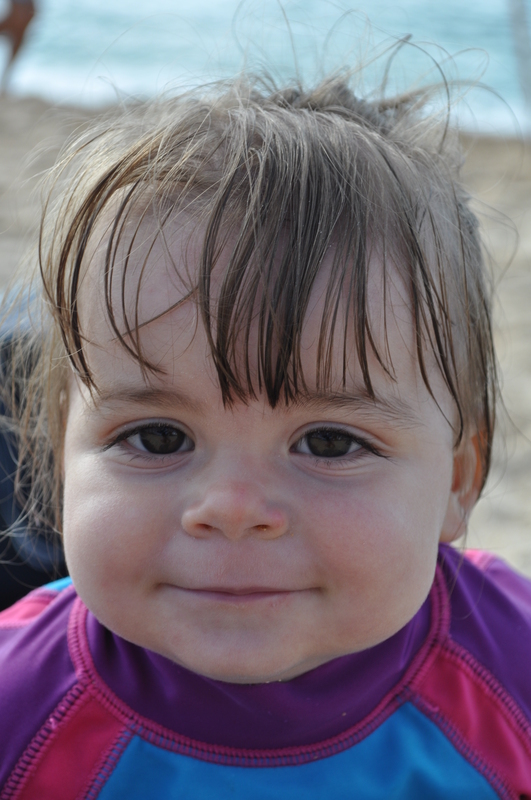 The day was spent playing in the sand – and of course snorkeling. Isabella went out a few times with Sherrie and myself. I finally got Lucas to go out once with me right before we left and I was able to tow Aurelia around on the boogie board with a window for about 10 minutes to see some Convict Tangs in the shallows. 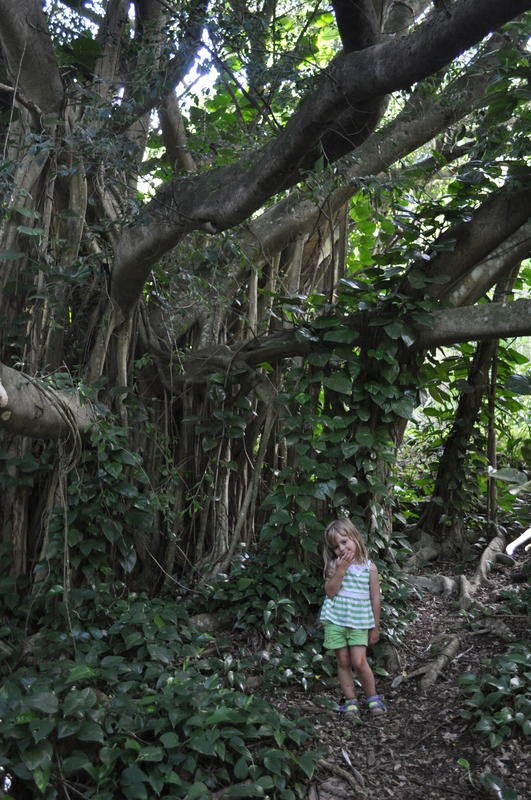 Isabella and I saw an octopus hiding in a hole along with many other types (Parrot Fish, Convict Tangs, Humuhumunukunukuapua, etc.). 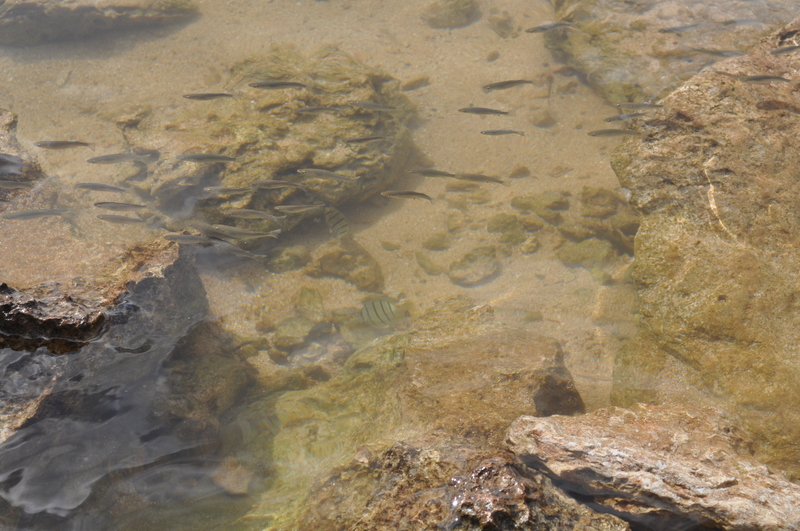 However, Isabella and I both spent a lot of time following a Coronetfish around. 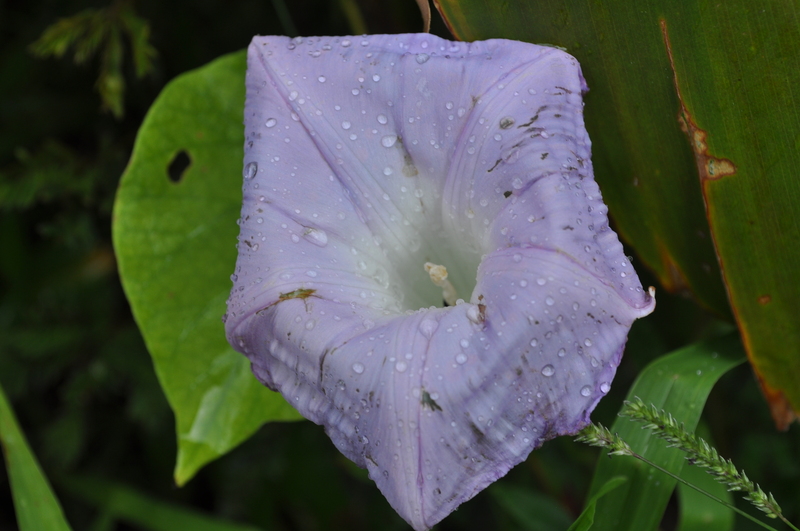 They are just beautiful creatures and so unusual – they look almost translucent in the water. However, no sightings of turtles this time.